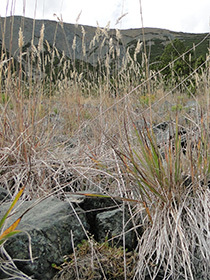 Key words: Biogeosciences, Geobiology, co-evolution, origin of life, Earth Systems, Earth-spheres, global changes, rock weathering, habitable spaces, aquatic and terrestrial ecosystems, evolution of biomes, high altitude, vanishing glaciers, colonising organisms, pioneering communities, biodiversity, soil, peat and lake sediment formation, re-forestation of alpine meadows and scree, effects on climatic cooling, Earth history, Anthropocene. 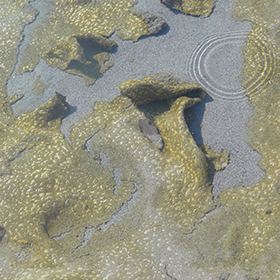 The Sciences of GeoBiology and GeoEcology deal with processes at interfaces between rocks, water, air and life. Chemical and physical interactions between rock minerals, water and atmospheric gases have played key roles for more than 4 billion years in making Earth a habitable planet and in the evolution of organisms. Chemical, physical and biological processes are still shaping the co-evolution of Earth-spheres today: the lithosphere, pedosphere, hydrosphere, atmosphere, cryosphere and biosphere. 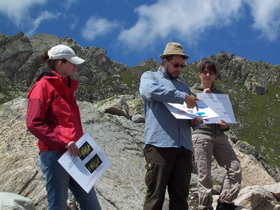 The geobioscience discovery workshops in the high mountains of the Alps offer unique opportunities to learn in remote areas - which are only minimally disturbed by human activities - how Earth's spheres are affected by ongoing global changes and how physical, chemical and biological processes regulate their responses. 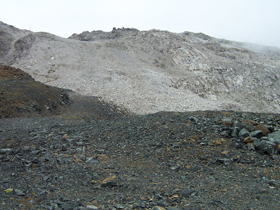 Due to retreating glaciers, "new land" is uncovered as rock scree. How long will it take for barren land to develop a soil cover that will support vegetation, allow trees to grow and finally act as long-term sinks for atmospheric CO2? How much carbon needs to be sequestered by high-altitude ecosystems to substantially contribute to the cooling of Earth's climate again? Tectonic and volcanic forces that were most active during the formation of the Alps and before, brought rocks of all major types together into a rather small area. 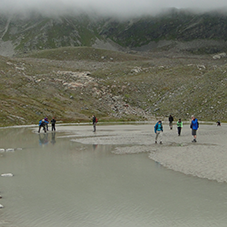 Metamorphic, igneous, sedimentary and evaporitic rocks are all present in the Silvretta GeoBioScience Arena.This allows one to study processes of soil and wetland formations on different bedrocks and under comparable climatic regimes and exposures. 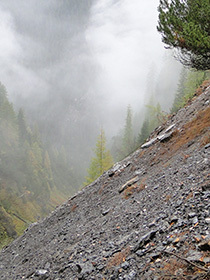 The harsh environmental conditions at high altitudes, like freezing and thawing of water, thermal expansion and contraction, chemical dissolution, etc., promote erosion and weathering of scree that had either just been broken off from mountain walls or that had been hidden below ice for thousands of years and are now being exposed again to atmospheric influences. 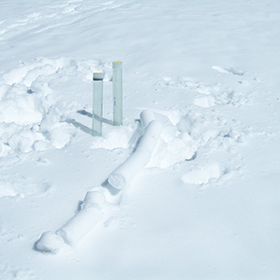 Inhospitable spaces become habitable once they have been exposed to solar radiation, to slightly acidic rain and snow, to wind and to atmospheric gases for some time. Spores, cells and seeds are transported by wind, insects, birds and other animals and microorganisms, lichens, mosses and best adapted ferns and seed plants become the first to colonize the now habitable niches. 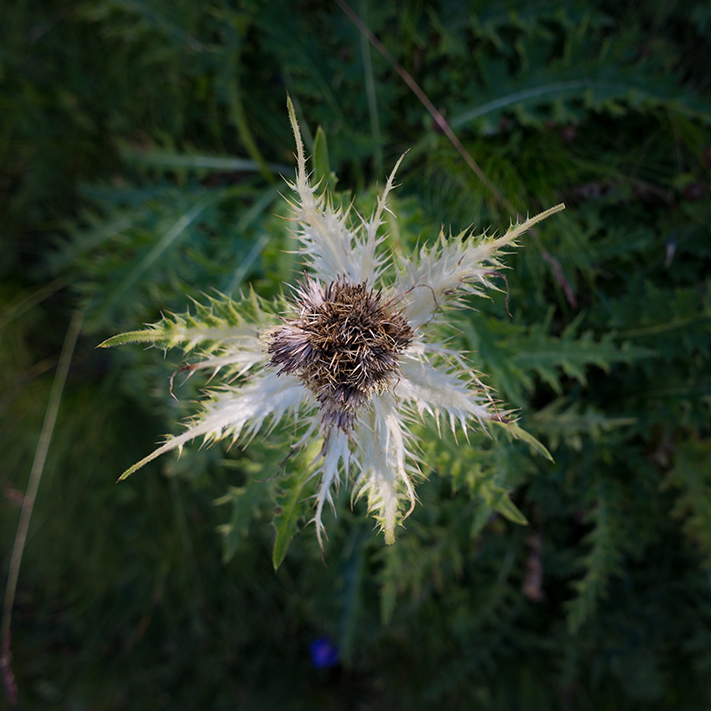 In "new" habitats at high altitudes we observe a quick gain of biodiversity even under the initially oligotrophic and extreme climatic conditions. 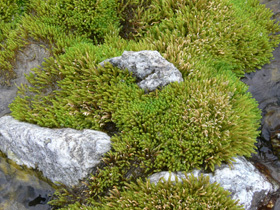 We can follow how communities originally consisting of only a few pioneering microbial populations evolve divers interacting community structures in biofilms, microbial mats and lichen thalli, then into moss pillows and short grass lawns with characteristic distributions of flowering plants. 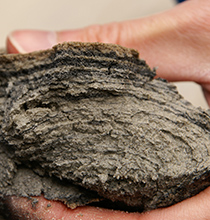 The ability to sequester carbon and nutrients are prerequisites for the formation of biomass in soils, peat, sediments and pelagic and flowing water bodies. Once nutrients are present we can follow the development of low diversity biomes into entire aquatic and terrestrial ecosystems. 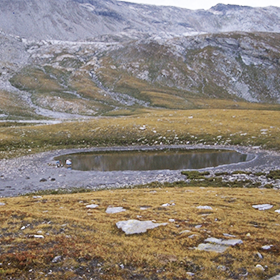 Retreating glaciers offer depositional forefields where microorganisms establish pioneering communities that will eventually develop into characteristic high altitude aquatic and terrestrial ecosystems. The biosphere's most fascinating attribute is its ability to respond to changes. 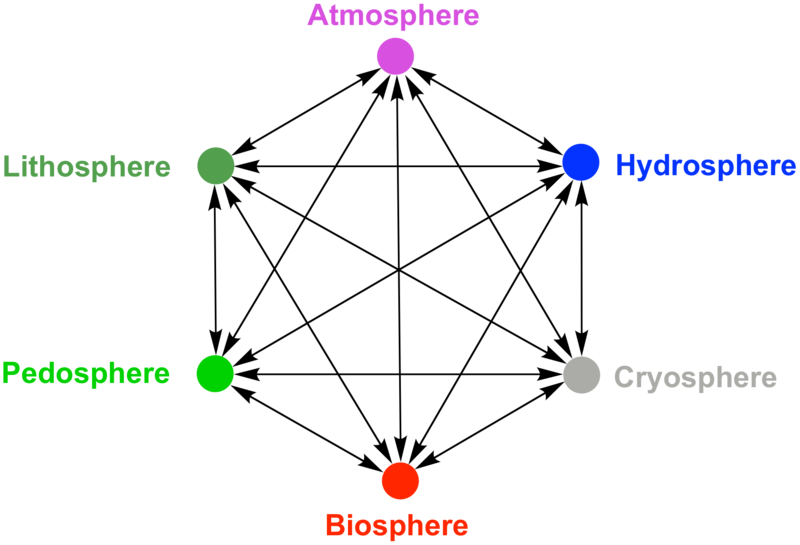 While processes in all abiotic Earth spheres follow physical and chemical laws exclusively, the biosphere in addition can adapt. It lets best suited organisms be selected as pioneers in new habitats, allows them to express those phenotypes which can make use of what is there and it has the genomic flexibility to acquire, develop and regulate genes and genomes according to needs and conditions. No other sphere can play the evolution game under constantly changing rules so well. 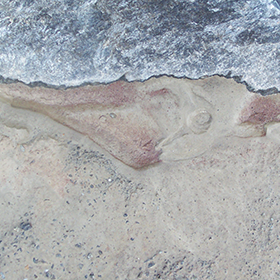 A large number of vertebrate, invertebrate and plant fossils are well preserved in the up to 241 million years old limestone deposits at Ducan Furgga (eastern boundary of the Silvretta nappe). They are being studied by a team of paleontologists guided by Heinz Furrer (University of Zürich). 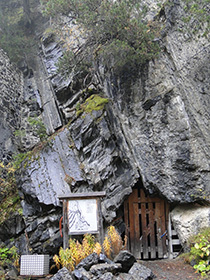 The museum of mining at Schmelzboden displays historic tools used in mining operations at the Silberberg mine and describes the mining of Pb and Zn sulfide from the middle ages to the late 19th century. The museum hosts one of the worlds most complete collection of calcite minerals. All the processes that occur in the different Earth compartments today must have happened again and again in Earth's long and varied history. 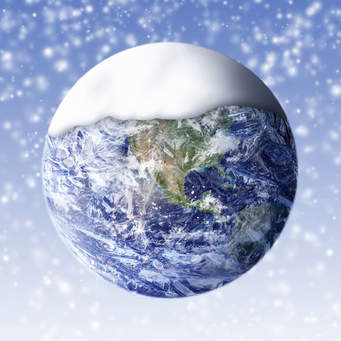 The snow ball (slush ball) earth hypothesis proposes that there were times in the Proterozoic when most of Earth's surface was covered with snow and ice for millions of years. Life, at least a number of microorganisms, must have survived and biogeochemical cycles must have continued to operate. 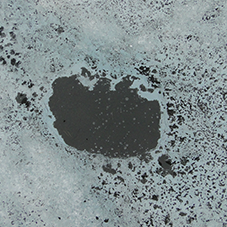 Arguments to what terminated the "cold ages" are still controversial, as are the reasons for explaining how Earth got into these icy states. 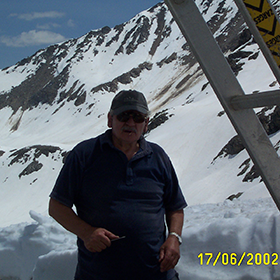 The modern climate began to warm up about 18'000 years ago and the alpine glaciers which had covered all of Switzerland during the last ice age in the north as well as in the south began to retreat. The modern Anthropocene will be the period when people warmed up the climate fast which altered rates of biogoechemical cycle processes. Nature will continue to adapt to it; but can it also reverse the human-induced changes and initiate a cooling period again? 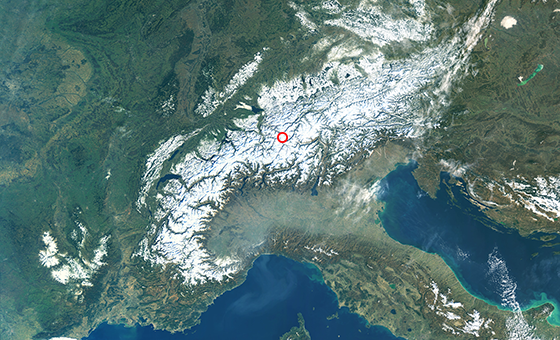 In relation to the 4.56±0.05 billion years of Earth history, the Alps are a rather young appearance on the European plate. 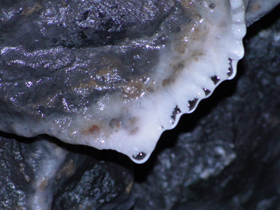 They began to rise out of the Tethys ocean some 35 million years ago when the African plate began to move northwards. 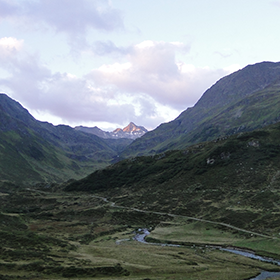 Many rock types in the Alps originate from former ocean sediments which recorded the state of the Tethys ocean over many hunderd million years. 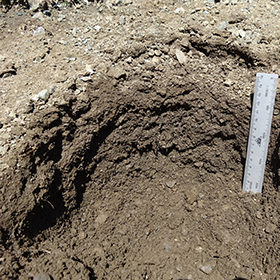 During the GeoBio-courses we study the depositional signals preserved in shales and deduce environmenal conditions of the past from the mineral composition in todays salty springs in the Lower Engadin Window. 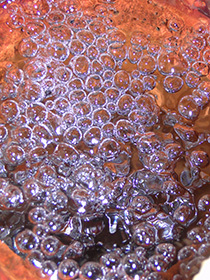 4.56 *109 years, about 1.4*1017 seconds are already huge numbers, but they appear small, if one considers that the number of presently alive microbial cells in all Earth spheres taken together is assumed to amount to about 9*1029 microbial cells, an inconceivably large number; but it is a small amount of biomass (ca. 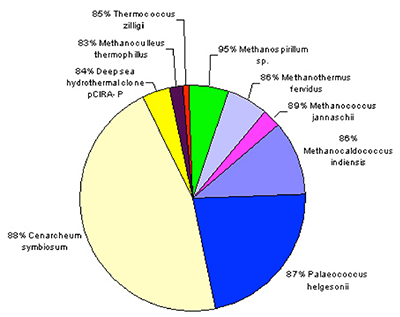 109 tons = 1 Gt, assuming a bacterial cells mass of 1 fg) which amounts to only a small fraction of the entire carbon pool. 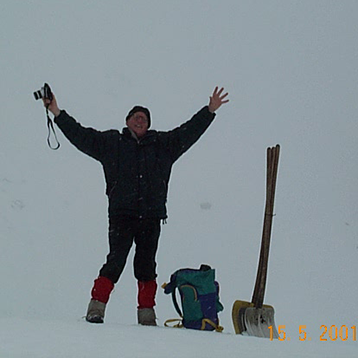 Processes in mountain ecosystems can best be understood, if observations and measurements can be done with high time resolution. This is dictated by the rapidly changing environmental conditions and the quick responses by organisms. 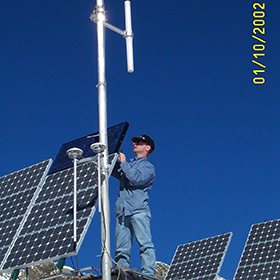 Today this is made possible thanks to the availablility of stable sensors and autonomous loggers or transmission connections even from remote areas. Newer developments of light weight spectral sensors with broad wavelength ranges and cameras allow one to use helicopters and drohnes and small remotely controlled underwater robots equipped with electrochemical and spectral sensors. 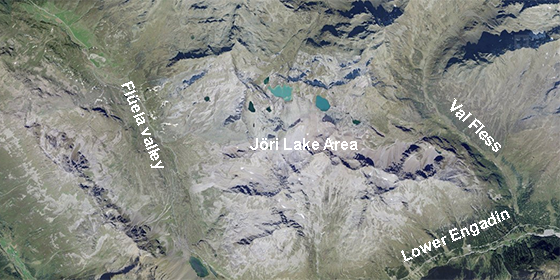 The image on the right illustrates that Landsat reflectance sensors can distinguish turbidity differences in several Jöri lakes. Ground-truthing of these measurements is clearly necessary. The latest trends in monitoring Earth from space are ESA's earth observation missions, e.g. with the group of Sentinel satellites which offer more frequent fly-overs and measurements with a broad array of specific sensors. Upcoming is the FLEX photosynthesis mission (launch planned for 2022). It will detect chlorophyll fluorescence by photosynthesizing vegetation which will give us a tool to follow carbon fluxes between the atmosphere and the biosphere. In the Biogeoscience courses we cannot miss these opportunities. 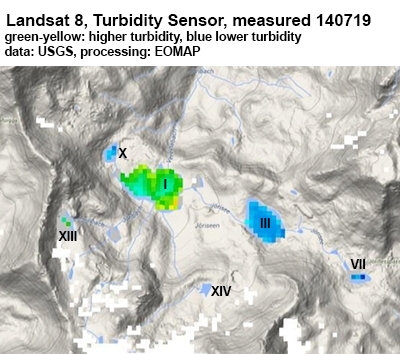 Lake I (l=530 m, w=325 m, 2489 m asl) appears green and yellow = high turbidity, and lake III (l=340 m, w=225 m, 2518 m asl), blue = low turbidity, are resolved with a reasonable number of pixels to distinguish turbidity differences. 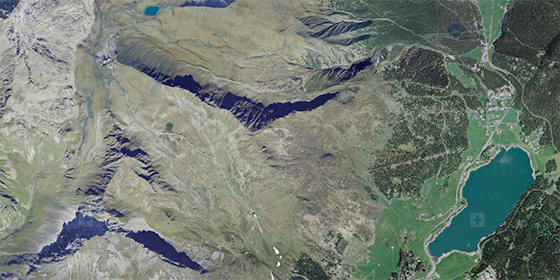 Lake XIII (l=220 m, w=130 m, 2639 m asl), yielded 3 pixels, too few to draw quantitative conclusions. 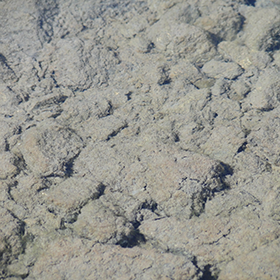 Lakes VII and X are much less turbid than lake III. 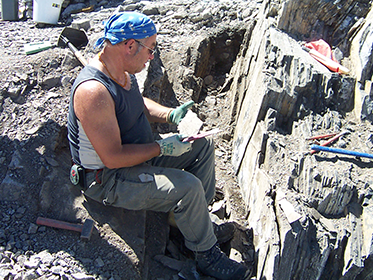 Thanks to environmental archives stored in rocks and sensitive analysis tools, earth scientists make guesses about processes and conditions that might have happed thousands and millions of years ago on earth. 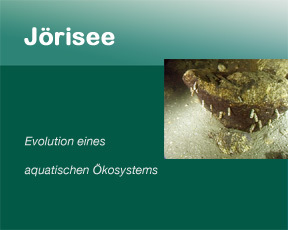 Together with the knowledge about the structure and the functioning of modern living organisms and by following characeristic biomolecules that are well preserved in the rock record they can reconstruct conditions and inhabitants of past habitats.What cannot be done yet, is to reconstruct how organisms responded to changes that occurred in the past and allowed some to adapt and survive while others got extinct. Scientists also like to predict the future. Based on data from present and past environmental changes and many assumptions they model possible scenarios for decades and centuries to come. As long as physical and chemical laws form the basis for modelling, predictions might look accurate. But responses of (micro)organisms to a combination of environmental variables are not predictable. 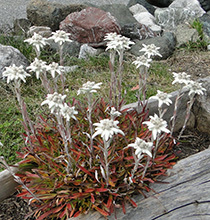 The conditions select for organisms that can make best use of the habitat. When conditions change, the community adapts and the diversity of organisms will change. habitable and who will be first to conquer the empty niches? The movie summarizes the contents of a few locations which we regularly visit during the field work. Details to the contents can be found in the paragraphs below and in the field guides. 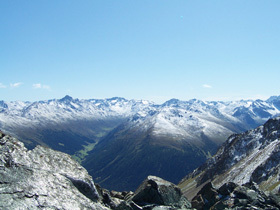 Legend to picture: View from Winterlücke N - NE. 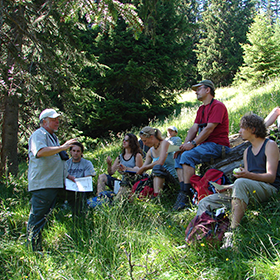 Field Trips with ETHZ, Universities of Zürich, Basel, Vienna, Tübingen and CUSO (Conférence universitaire de Suisse occidentale) in the Jöri Lakes Catchment. 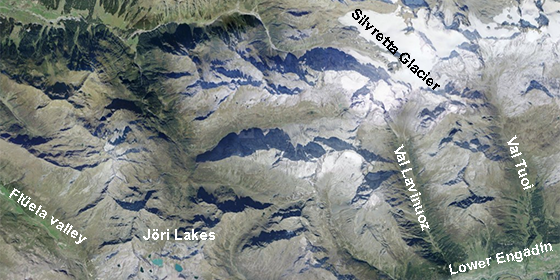 Reconstruction of the extent of the Jöri glacier in the second half of the 19th century. It reached the lowest lake I and left a moraine on the SW side of the lake. 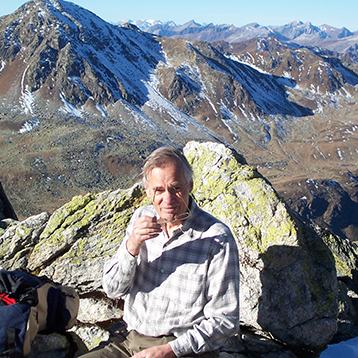 Key words: Earth systems studies, discovery, interdisciplinary collaboration, integration, connecting disciplines, geology, biology, ecology, hydrology, atmospheric physics, chemistry, socio-economics, synergistic research, observations, sample collection, thematic learning units, hands-on science, field trips, lectures and seminars, research questions, economic considerations, reporting results, reflection. The study of Earth systems requires an interdisciplinary approach which needs to integrate knowledge from many natural science disciplines, socio-economic sciences and medicine. 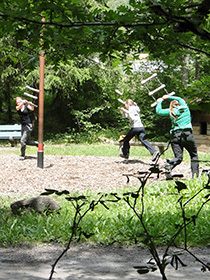 This is reflected in the training during high mountain discovery workshops which involves the experience of a number of researchers and students who work or have worked for many years in mountain ecosystems on topics at the overlap between geology, biology, ecology, hydrology, atmospheric physics, chemistry and their links to regional socio-economics and even geo-medicine. 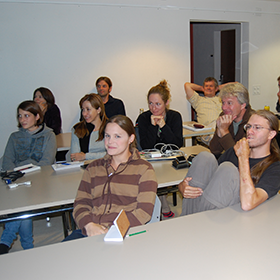 Participating instructors are willing to share their insights with promising young researchers. The result of this interdisciplinary collaboration is a compilation of innovative, multidisciplinary discovery courses, which are offered by a network of researchers to motivated students and active scientists from various disciplines from all over the world. Special courses are also offered for teachers at Swiss High Schools, artists, journalists and the scientifically interested public. The contents are structured as learning units which are combined into thematically focussed courses according to the interests of the particular groups but always with a strong emphasis on crossing boundaries between different scientific fields. A few themes and new directions are compiled in this website. 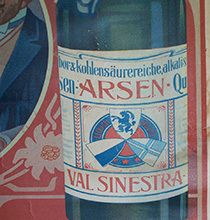 Each theme is discribed in a few sentences and illustrated with images from the particular sites. Field Guides which are available to workshop participants offer more detailed descriptions of topics and give links to the scientific literature. Topics can change as research progresses and as new contributors with synergistic research programs and innovative methodologies join the dynamic network. Science becomes more exciting, if one succeeds making connections between different disciplines. 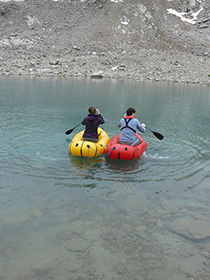 High Mountain Discovery Courses promote this learning approach. 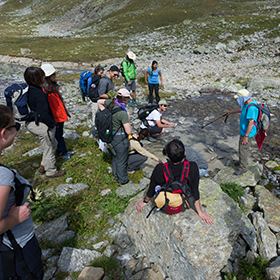 All courses are organized as mind-opening, hands-on science workshops which enable participants to gain practical experiences in nature and to learn from each other. 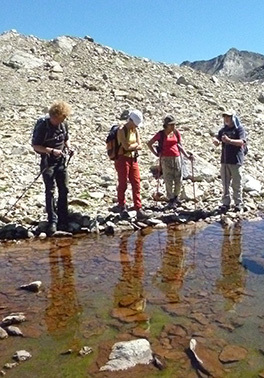 Each workshop consists of field trips to instructive sites in the Silvretta Arena where we observe new habitats in glacial retreat basins, follow how rock weathering promotes habitability, soil formation on different bedrocks and the development of diverse vegetation covers, study sulfur, arsenic and high carbonate and iron springs in the geologically famous Lower Engadin Window and in the gypsum area of Alvaneu and many more. 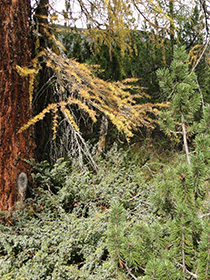 At the workshop home in Davos we work up observations and collected samples, address key issues of the evolution of high-altitude ecosystems from barren rock debris fields into habitable spaces, how they are then being colonised, primarily by microorganisms in the beginning, and how conditions created by global change processes are directing habitat evolution. Work-up days contain lectures and seminars by experts who also guide the participants through scientific details of their selected project work. Each workshop finishes with presentations by participants of their research proposals which they develop based on their field observations. During workshops we do not execute research per se but initiate thinking about appropriate research questions and approaches to tackle them. 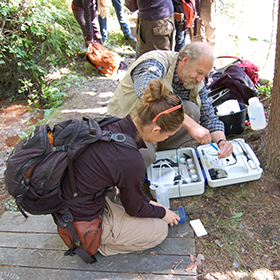 Participants are encouraged, however, to continue working on collected samples in their home laboratory. Planning together, doing with advice, learning from each other, explaining, discussing and reporting results to all. By training the next generation of researchers, teachers and decision makers, the courses aim to offer connections between basic scientific research and the integration of its results into societal insight, economic considerations and teaching. 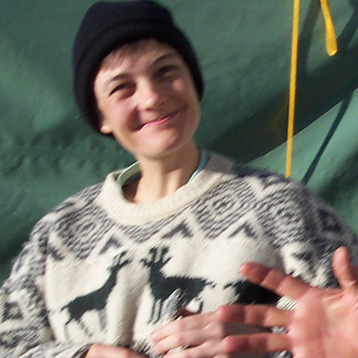 In addition, a few days learning in a field course can be relaxing for a person with a stressed working pattern. Getting away from lab and office for some time and distancing oneself from the daily burdens refreshes ones mind and opens eyes for new insights. It allows instructors time to reflect, to listen to and responsibly care for participants' ideas and ambitions, enriches ones experience and makes one aware of what nature actually teaches us. 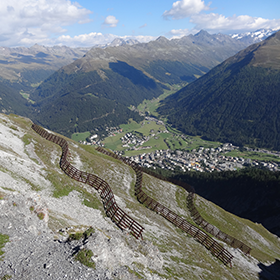 Key words: Integrating study area, topography, landscape morphology, high altitude, continental divide, Rhine, Danube, Tambo, J�ri, Silvretta, Weissfluh, Lower Engadin Window. 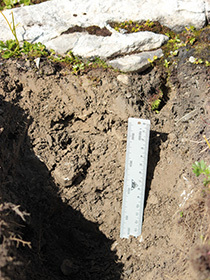 Alpine tundra, nival zone, abrasion particles, atmospheric dust, salt precipitates, fertilisation. 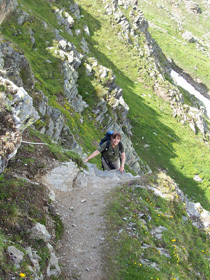 Mountain i-ESS training schools take place from August to September in the Silvretta Arena in the Swiss Alps. 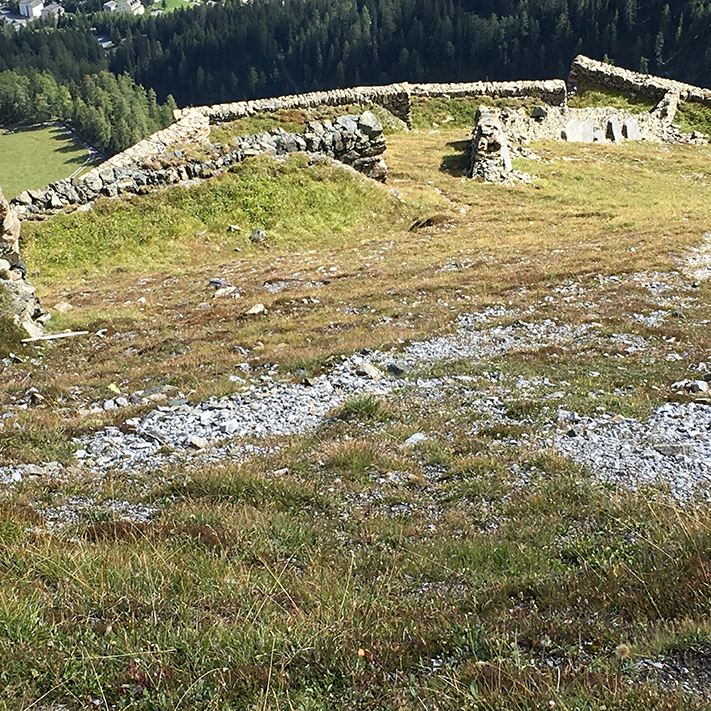 The Arena is located in the southeastern part of the Canton of Graubünden. 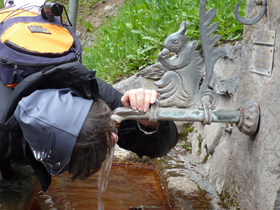 Its headwaters are at the continental divide between the Rhine and the Danube catchments. 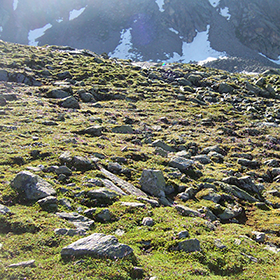 Studies focus on the transition from the uppermost forested land across the climatic tree line and alpine meadows and tundra to the high mountain nival zone where rocks, rock scree slopes and ice dominate the landscape. 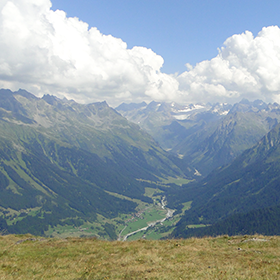 This type of High Altitude Areas account for 25 % of the entire area of Switzerland. L: The snow-covered 1200 km long Alpine arc between France in the west to Slovenia in the east as captured on February 16, 2019 by the Copernicus Sentinel-3A satellite. 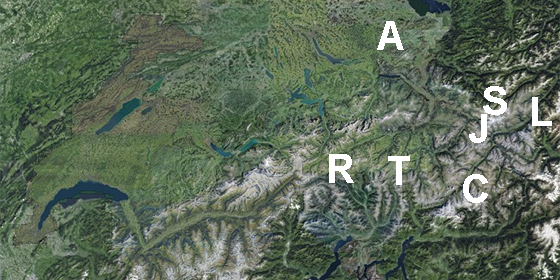 R: The Alpine arc crosses Switzerland on the south. 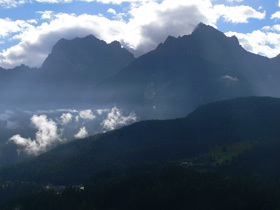 The mountains in the western part are generally higher than in the eastern part. The green lines are vegetated valley areas. 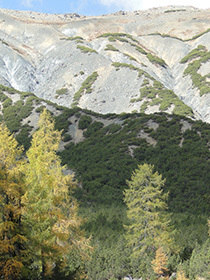 Depending on region, bedrock and exposure, the tree line reaches up to 2000�100 m; short grass meadows are present as high as 2700 m.
The valley bottoms and slopes are vegetated up to a certain altitude. 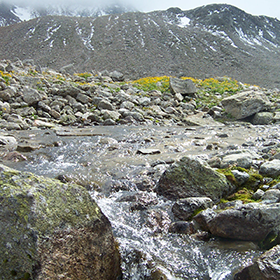 Above the upper treeline, scarce vegetation, barren rocks,rock scree slopes and ice can make up more than 90% of the area. What will these environments look like in a few years? 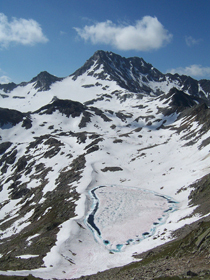 L: The upper Silvretta valley is still covered with glacier ice today, but one can expect a number of lakes to appear in the wide, rather flat valley between Rotflue - Silvrettahorn in the North and Chremerchöpf - Gletscherchamm - Silvettapass as the glacier retreats further. 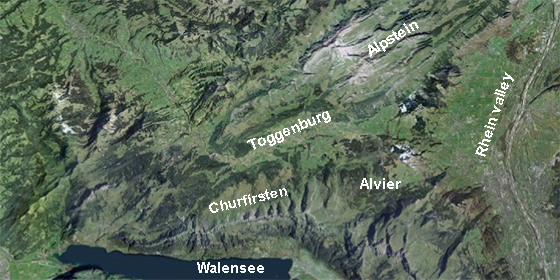 R:Tectonically the Churfirsten-Alpstein nappes are separated by the Toggenburg valley. 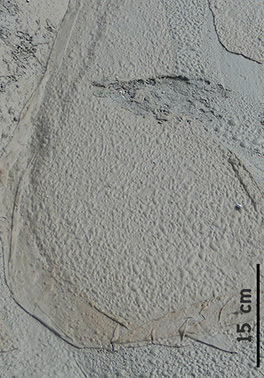 They consist of fossile-rich former carbonate sediments that were originally deposited during the Cretaceous in the northern shelf of the Alpine Tethys. A key role in the sequestration of inorganic nutrients, carbon and organics is played by nanometer-size rock abrasion particles (e.g. 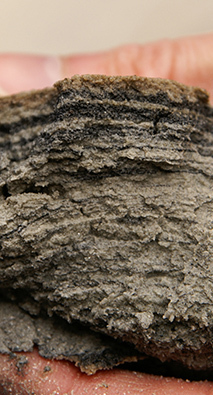 clays), by wind-blown dust and atmospheric salt precipitates (e.g. (NH4)2SO4). 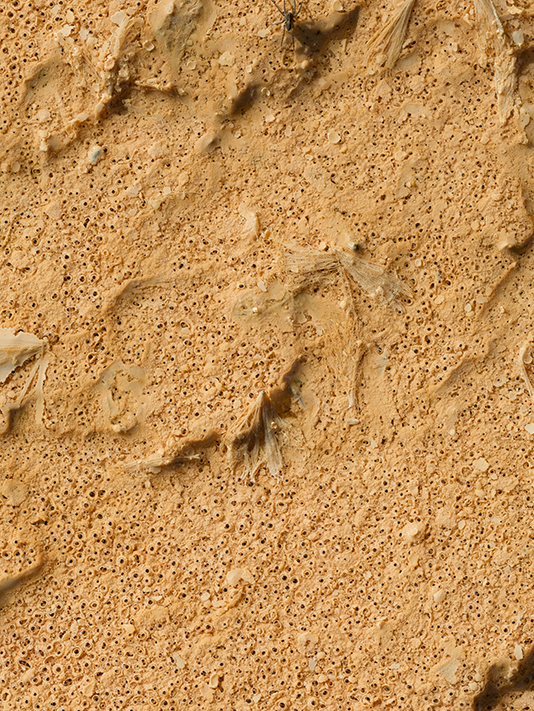 It is the characteristics of these particles which makes them key ingredients for sediment and soil formation and fertility. how do they recover from disturbances? 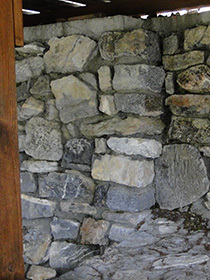 How are niches for new life created in various dimensions and at different altitudes? what functions do they play in coupling geochemical cycles? 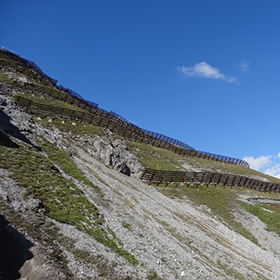 which morphological and physiological features allow plants to migrate into niches at higher altitudes? What role do high mountain areas play in atmospheric carbon sequestration, first in soils, peats and sediments, later in forest trees? 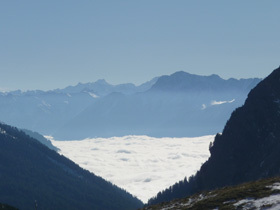 what is the potential of forestaton of high altitude lands of becoming substantial CO2-sinks? 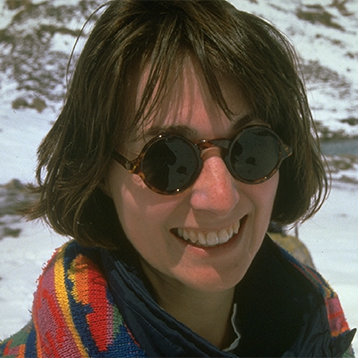 Key words: Hans Kreis (1920), Microbial Ecology and Evolution Courses, historic photographs and geographic maps, high-altitude research, learning, Third Pole. 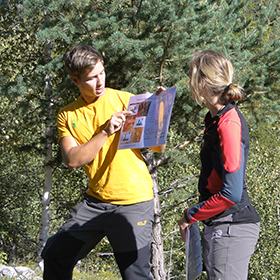 Courses and research projects are evolving with new topics contributed by course participants who monitor and study the area every year and make discoveries as well as by natural events. 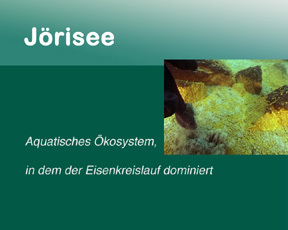 The investigations that started with Hans Kreis' work on "Die Joeriseen und ihre postglaziale Besiedelungsgeschichte.pdf" (1920) layed the foundation for today's interest about habitability of "new" spaces and ecosystem evolution. 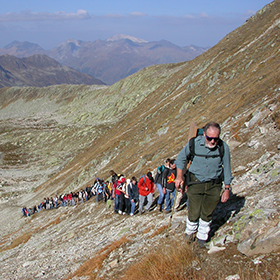 Today's i-ESS Geobio-Science Courses evolved as an extension of the curricular "Microbial Ecology and Evolution Courses" that were taught at the University of Zürich from 1979 to 2008 and were then continued as interdisciplinary Geomicrobiology courses and then as Biogeoscience courses at ETHZ. In collaboration with researchers who contributed strengths in a variety of fields we were able to develop a community of scientists that allowed the compilation of today's truly interdisciplinary courses. 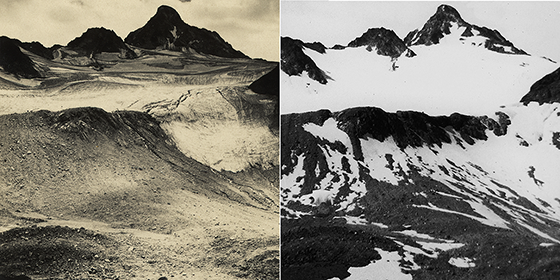 Photographs from Hans Kreis' picture album covering his doctoral years at Jöri and 10 years later (1928): Jöri Glacier and Lake XIII. Picture 3 from left was taken 1967. 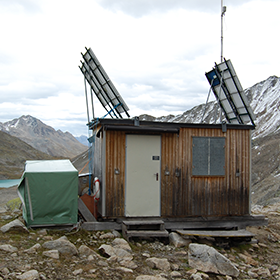 During the past few decades, the GeoBio-Study Arena Silvretta has become an internationally appreciated High-Altitude Geobiological Research and Learning Location. 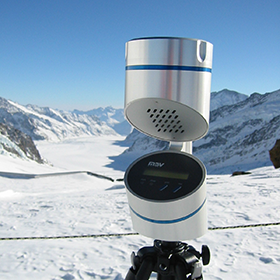 In Switzerland, it serves as a "Third Pole" high altitude observatory where the chronology of low-temperature biogeochemical processes in cryospheric habitats (permafrost soils, lakes in glacial ice, cryoconite holes and snow) can be studied under changing environmental conditions and be compared to similar occurrences at Earth's high latitude sites, i.e. in the actual polar and other cold-arid regions. Key words: Conrad Gessner, B�n�dict de Saussure, Louis Agassiz, Albert Heim, theory of glaciers. 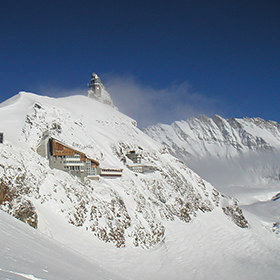 Observatory Jungfraujoch, Institute for Snow and Avalanche Research, Swiss Foundation for Alpine Research, Interacademic Commission for Alpine Studies, Swiss Committee on Polar and High Altitude Research, ProClim, Mountain Research Initiative, Swiss Polar Institute. 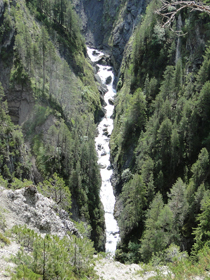 Bénédict de Saussure (1740-1799), a geologist from Geneva, who climbed and investigated Mont Blanc in 1787, Louis Agassiz (1807-1873) who developped a theory of glaciers by studying the Aare glacier and, Albert Heim (1849-1937), are credited with pioneering geological studies of the Alps in the 18th and 19th century. Some 200 years earlier, it was Conrad Gessner (1516-1565) who collected, made drawings and described alpine plants, and most important, was able to make use of the newly discovered printing technique. 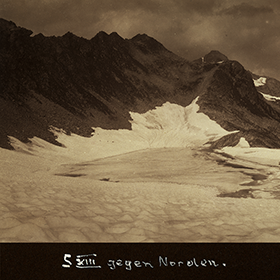 Shortly after the completion of the Jungfraubahn (1912), Alfred de Quervain, a meteorologist, and W.R.Hess, a physiologist, initiated the construction of an observatory at Jungfraujoch (3554 m a.s.l.) which was inaugurated in 1931. The Sphinx Meteorological Observatory opened in 1937. 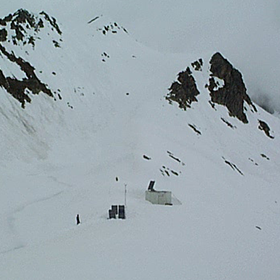 Today the station is adminstered by the International Foundation for the "High Altitude Research Stations Jungfraujoch and Gornergrat". 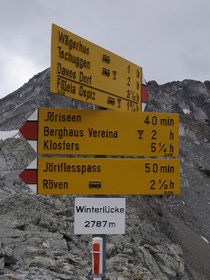 In 1942, the Swiss Federal Institute for Snow and Avalanche Research (SLF) opened its first snow laboratory at Weissfluhjoch. 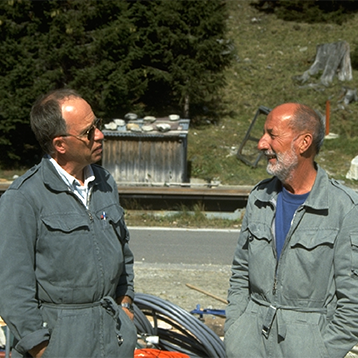 Within the last decades, the SLF, located in Davos-Dorf, expanded its mandate and became also the Swiss Mountain Research Institute. 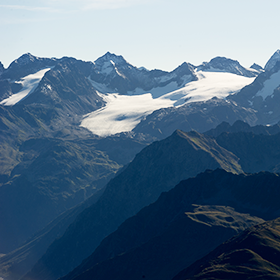 A broader interest in the "High Altitude Research" began in Switzerland in the 1930ties when the Swiss Foundation for Alpine Research suppotred scientific exploration expeditions to the Himalayas. 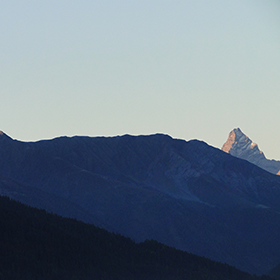 This support resulted in the successful first climb of the Lohtse (8501 m) and the second ascent of Mount Everest (8850m) in 1953 by teams of Swiss mountaineers. 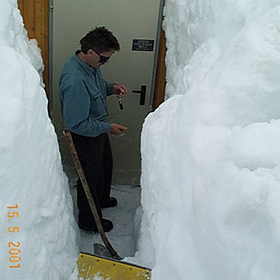 The Jungfraujoch Research Station is well suited for experiments involving airborne microorganisms, dust, snow sampling and radiation measurements. 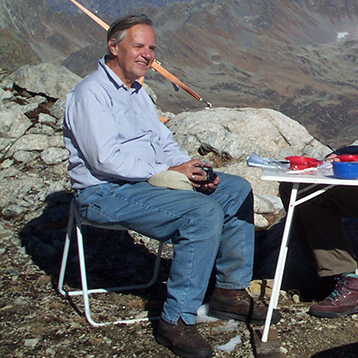 The Swiss Academies support two committees that deal with High Altitude Research issues: The "Swiss Committee on Polar and High Altitude Research" and the "Interacademic Commission for Alpine Studies (ICAS)". 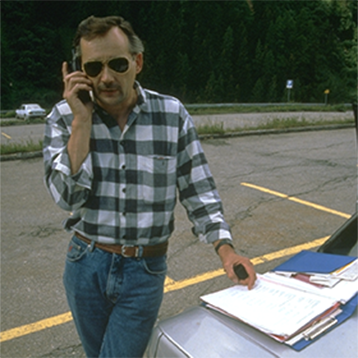 The latter emerged from the first Alpine Forum a Gordon Research Conference type meeting held in Disentis, Switzerland, in 1994. 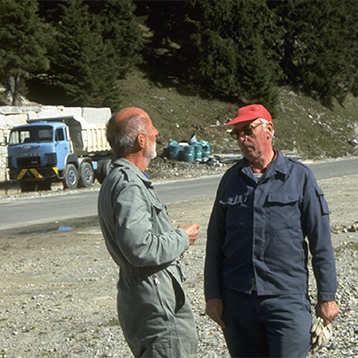 The 1990ties were the times when the referendum on the protection of the Alps from transit traffic was accepted by the Swiss voters (1994) and a number of national and European research programs were launched by the Swiss National Science Foundation and the EU framework program. 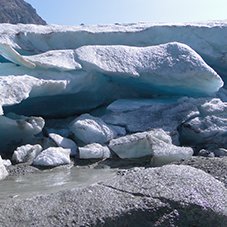 ProClim, the Academy's Forum for Climate and Global Change, compiles ongoing research projects in these topics in a publically accessible database. 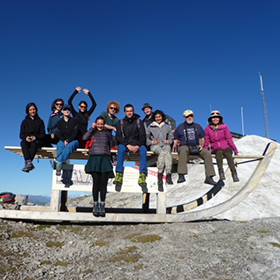 The Swiss Agency for Development and Cooperation (SDC), a coordinating body for international collaboration of the Swiss Federal Department of Foreign Affairs and the Swiss Academy of Sciences support the Mountain Research Initiative (MRI) at the University of Bern. 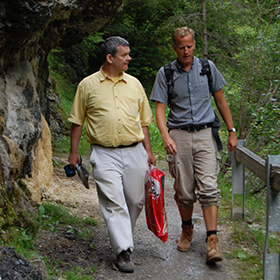 The MRI supports coordinating efforts among the mountain research community world wide. 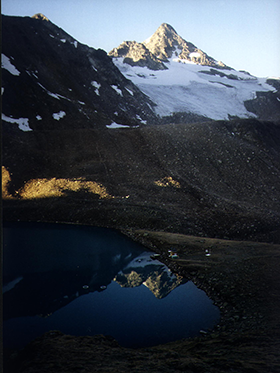 It emphasises the socio-economic and socio-ecologic role of knowledge gained through research in mountain areas and its impact on cultural development and policy processes. 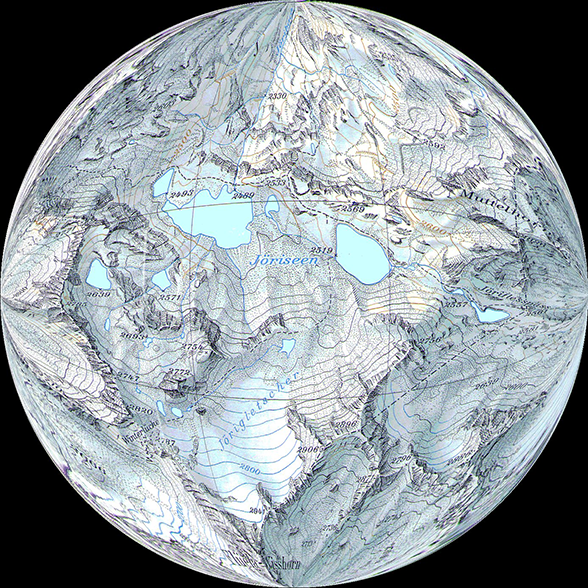 MRI and Proclim also offer links to national and international mountain-related datasets, databases and projects. 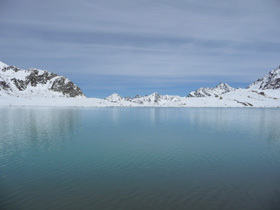 The most recent addition to the "Third Pole" initiative is the Swiss Polar Institute (SPI) established at EPFL in Lausanne in 2018. 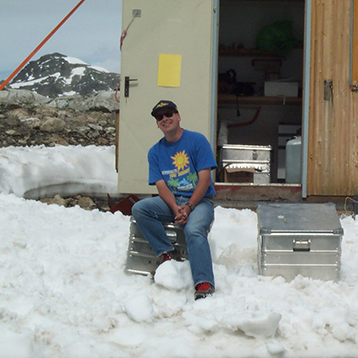 Although its main objective is to promote Swiss research in the "real" polar regions of the Earth, it also supports synergistic research in extreme environments at the "Third Pole", i.e. 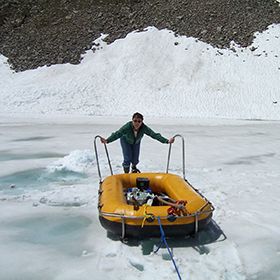 cryospheric, biogeochemical, engineering and ecosystem studies in alpine and other extreme environments. 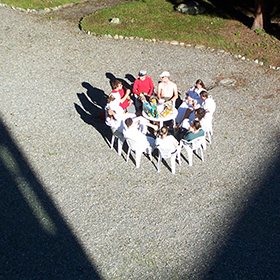 At the same time the Université de Lausanne began to assemble research groups in a Centre interdisciplinaire de recherche sur la montagne. 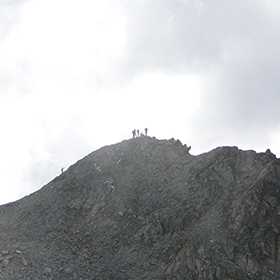 Key words: Research possibilities, topics in high-altitude geobiosciences, motivation, curiosity, collaboration, teamwork, knowledge sharing, inspiration. 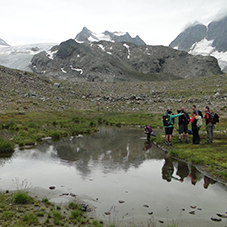 The annual Geobioscience Workshops in the Silvretta Arena can stimulate a range of new research possibilities and applications to science and engineering students in many fields. 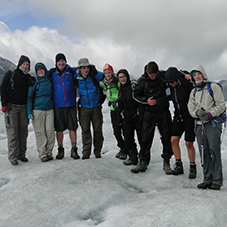 They are open to students pursuing to study a topic in high-altitude geobiosciences or environmetal sciences who like to enrich their experience with an overarching educational approach. Focusing on global and regional environmental change processes makes participants aware of new topics in these science fields. 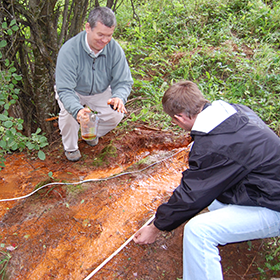 University graduates and teachers of geobiology as well as other chemical, physical, geological, biological and environmental scientists might get attracted by the interdisciplinary program. Presenting their observations and research in outreach activities is making global change issues more accessible to teachers and the interested public and attractive for learners. 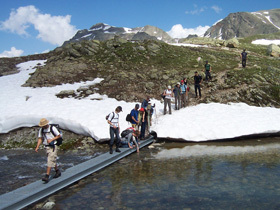 Those invited to participate at courses are motivated and curious students and established investigators at different levels from academic institutions in Switzerland and from around the world who are interested in working together, learning from each other in interdisciplinary teams and sharing their knowledge. 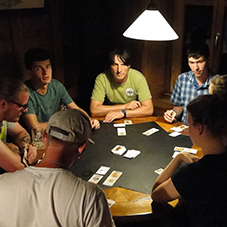 When geographers meet chemists, microbiologists get to know environmental engineers or botanists discuss with geologists and physicists they inspire each other and come up with new questions and approaches to answer them. The course language is normally English, but we switch to German, if this is requested by the participants. 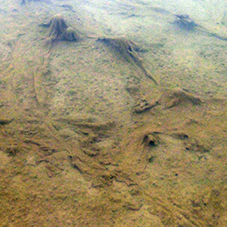 Quite often, unique ideas arise when our experience and skills encounter the unexpected, prompting discussions in defining the more promising approaches to explain a phenomenon; how to best combine advances in cultivating microbes, DNA sequencing and other molecular technologies and bioinformatics with precise chemical and geological analysis methods in order to understand how the evolutionary experience of organisms guides them to colonise "new" habitats. 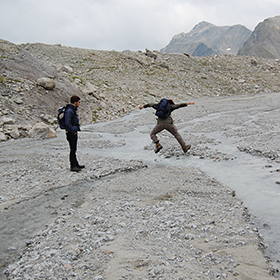 In the Silvretta glacier retreat area subglacial abrasion of rocks by ice creates reactive mineral particles ("rock flour") which settle in sedimentation ponds in glacial forefields. 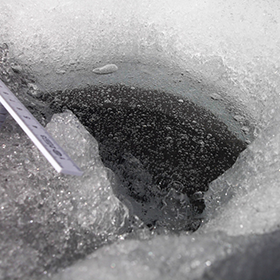 How are their sediments structured and what kind of past environmental information that was formerly frozen in the ice do they still contain? Key words: Long-term, current global changes, barren locations, different lithologies, clastic shale sediments, metamorphosis, Tethys, subtropical to tropical ocean basins, oceanic anoxic events (OAE), evaporites, sustainable biosphere. 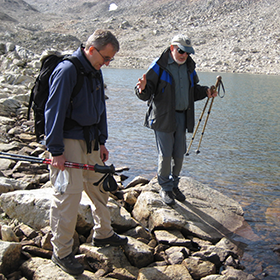 The area offers an enormous wealth of topics that beautifully illustrate what long-term and current "global changes" mean for high mountain areas, how they happened in the past and how they alter mountain environments today. We work in a natural science laboratory, where atmospheric chemistry interacts with hard rocks thereby making barren locations habitable. Habitable spaces are created where energy, oxidants and nutrients from the lithosphere and the atmosphere are transferred via the hydrosphere and where organisms can exploit them for their growth thereby creating a sustainable biosphere. 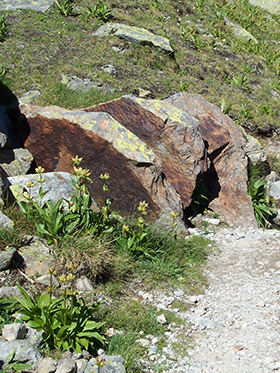 In the Silvretta Arena we find quite different lithologies: Dolomite, Radiolarite and Serpentinite at Parsenn and Paragneiss and Orthogneiss as components of the Silvretta nappe at Jöri. 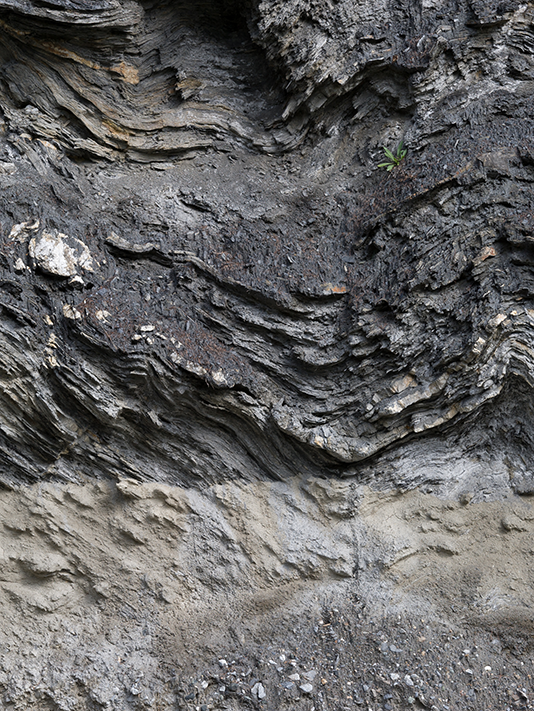 In the Lower Engadin Window, ancient fine-grained clastic sediments that express oxic and anoxic periods in the Alpine Tethys Ocean during cretaceous and jurassic times are accessible today on top of the penninic bedrock. 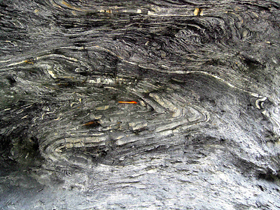 These sediments appear as thinly laminated shales that contain a rather high content of organic matter and clays. 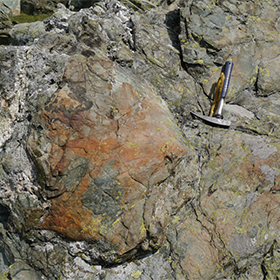 We observe different grades of metamorphosis, foliated slate, phillite and medium grade schists at locations that were exposed to higher pressure and heat. 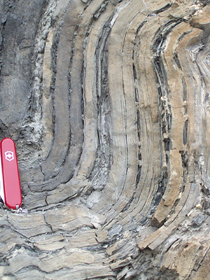 These lithologies and evaporitic limestone sediments -- including fossils at Ducan which got burried in the middle Triassic in a Tethys ocean shelf, and stromatolites at Ofenpass, which might have been formed along the shore of subtropical and tropical ocean basins -- illustrate the dynamics of habitat changes over geologic time periods. 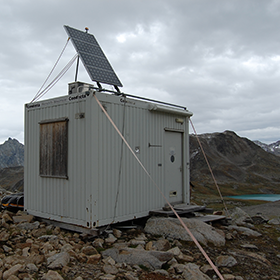 Lightweight, mobile containers that can be transported by helicopter serve as high-altitude laboratory and shelter for researchers and visiting groups. 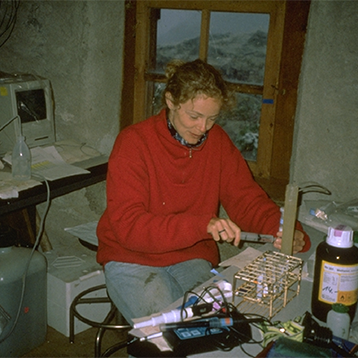 Safe working conditions are essential for research at high altitudes. 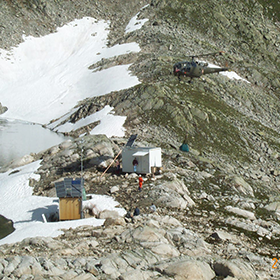 Establishing and maintaining research stations in the mountains requires a lot of logistics and demanding engineering for power coversion and communication that must function also under harsh winter conditions. The costs should not be underestimated. Key words: Deglaciation, late Pleistocene, landscape modifications, disappearing glaciers, hydrologic changes, ephemeral lakes, dry soils, water and land use. Transitions, adaptations to change, harsh environments, natural destructive forces, microorganisms, metabolic potential, evolutionary experience, biogeochemical cycles. Many Europeans live today in areas which were still covered by glaciers less than 15'000 years ago. Presently, we are experiencing the last phase of deglaciation which began in Europe with the Holocene and which accelerated in the last two centuries. 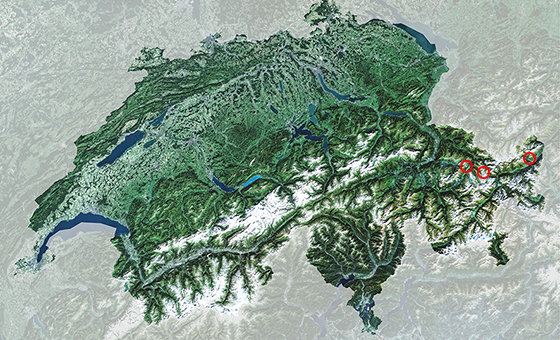 In recent decades the highest regions of the Alps went through dramatic transitions. Nowhere does "global change" leave more visible landscape modifications than in the icy regions of high mountains and in polar regions of our planet. 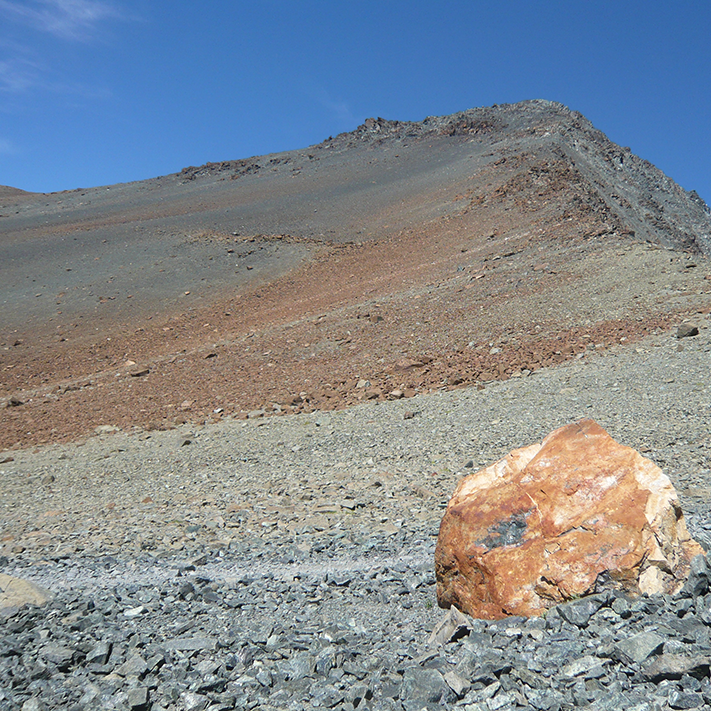 Landscapes as we knew them from a few years ago no longer exist; glacier ice vanished, fields that were covered by snow all year long are exposed today as rock debris deserts (scree). 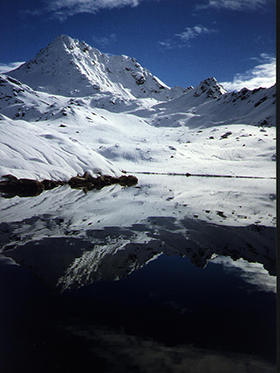 Glaciologists predict that the dead ice of the Jöri and Tambo glaciers and the permafrost ice at these altitudes will disappear within the next decade; the Silvretta glacier might be gone by the end of the century. This will severely change the hydrology and reduce the amounts of water that feed rivers and lakes during the warmer summer months. 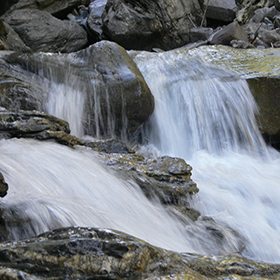 And since evaporation increases in warmer climates, lakes become ephemeral, soils dry up, vegetation at lower altitudes grows more slowly, grazing animals cannot find enough food anymore, springs run dry, river water warms up which makes life uncomfortable for fish and water for irrigation, drinking and hydropower production will become scares. 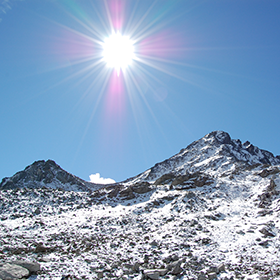 Weather patterns might change such that there will be more snow in winter, but do to elevated temperatures rates of sublimation and melting will increase and melt water flows will be intense in spring, but low in summer. 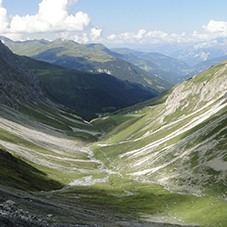 For nature changes are always also opportunities to adapt and to conquer new spaces as is best illustrated by the development of once glaciated areas at lower altitudes where most of us live today. In mountains at high altitudes we can study and follow transitions and adaptations as they are occuring today and as they might have happened many times in the Holocene. 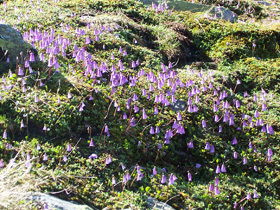 High mountain areas host a heterogeneous variety of small and large scale habitats each expressing different and quite variable living conditions. The latter are consequences of static and dynamic influences which are characteristic for the geographic location, the lithology and the variability of the hydrologic conditions between spring and summer. Favourable conditions keep spaces habitable, they guide the colonisation by diverse organisms and they allow for the development of stable ecosystems. Unfavourable events -- dramatic changes in water flow regimes or destructive forces like rockfalls and mud sildes-- are natural challenges for the inhabitants. They might all get wiped out and colonization has to start all over again. 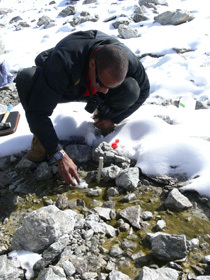 We focus on microorganisms as the first colonizers of "new" high altitude habitats, because microbes have the broadest metabolic potential of all organisms and the longest evolutionary experience to cope with challenges and they can respond quickly to changes in oligotrophic and harsh environments. The global microbiome contains all metabolic abilities that are needed to drive biogeochemical cycles; the environment selects for the ones needed under the prevailing conditions. Microbes grow fast, they can rapidly adapt phenotypically and genotypically and they can tolerate coditions which we tend to call "extreme". Over time, environmental changes shape and reshape landscapes and living conditions, thereby dynamically creating new niches for an abundance of different forms of life beyond microorganisms. Key words: Habitability, topographic relief, capturing and retaining organic carbon, weather extremes, erosion, opening spaces, conditioning habitats, colonization, development of ecosystems. 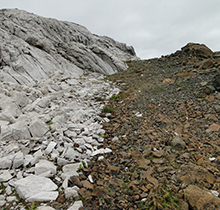 Habitability of the "new" spaces released as glaciers retreat is determined by the morphological suitabiity of the landscape, the mineralogy of the mountain-forming rocks and their exposure within the topographic relief. 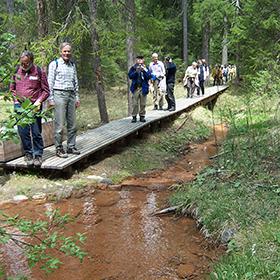 Some sites in the area allow one to study the evolution of aquatic ecosystems others the capturing of organic carbon in plant roots and rhizomes (cellulose) and fungal mycelia (chitin) during soil formation. 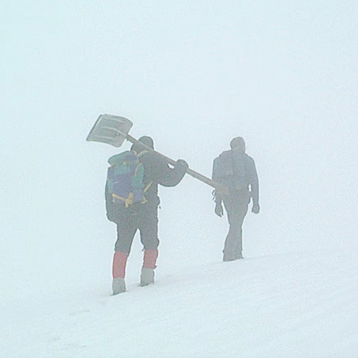 Seasonal weather extremes, altitudinal temperature gradients and climate, floods and drought, avalanches, rockfalls, land slides and debris flows, strong winds, cloud circulation patterns and differences in snow and rain precipitation are all forces that determine the extent of weathering and erosion. These forces prepare aquatic and terrestrial niches for colonisation by organisms and their dispersal. 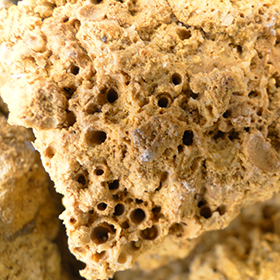 how do rocks create living conditions in, on and from them? which are the first colonizers and the primary producers in newly opened spaces? 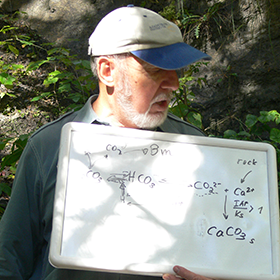 which organisms feed the first organic carbon to a new habitat? 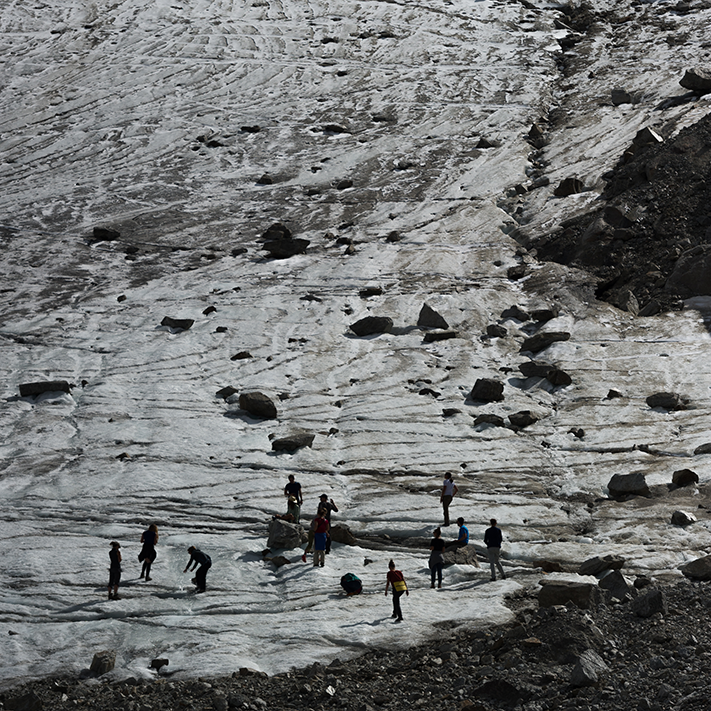 what will happen to them once glacial melt water flow ceases? 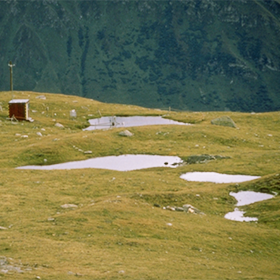 The Silvretta Arena allows one to study every step from the opening of new spaces to their "conditioning" as habitats, to their colonization by organisms whose metabolisms have to respond to the extreme and extremely variable conditions at the high altitudes and, finally, to the development into fully functional ecosystems in spaces that were covered by ice until a few decades ago. 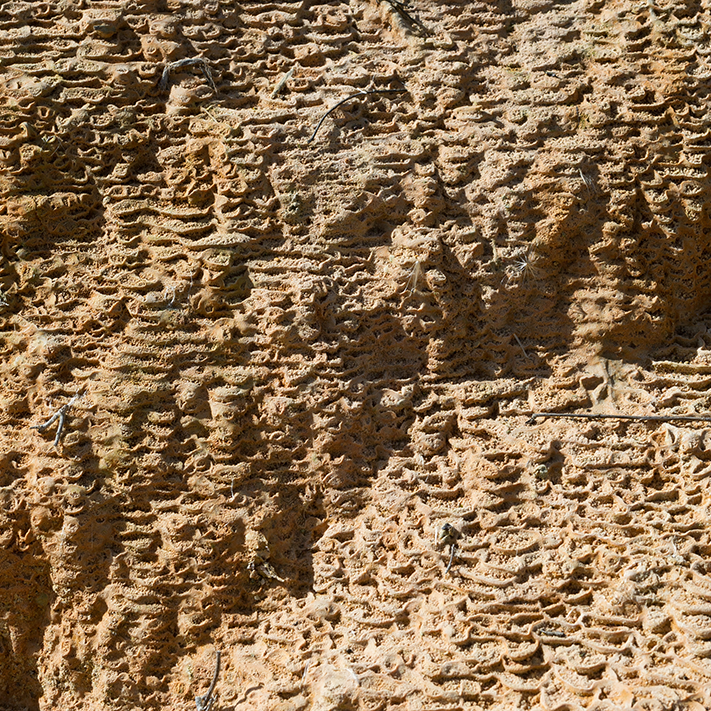 Key words: Serpentine, magma extrusions, serpentinisation, rock components preventing soil formation. 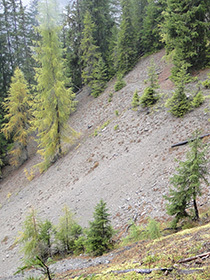 Why is Soil Formation on Serpentine Bedrock so slow? 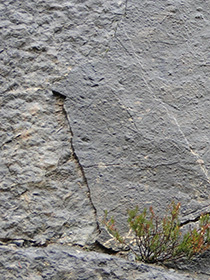 Magnetite containing serpentine at Totalp and pillow lava structures at Fuorcla Champatsch lead us back to Jurassic times when magma extruded from the earth crust to the former Tethys (Piemont-Ligurien Ocean). The igneous mantle rock serpentinised and liberated chemical energy from mineral oxidation, most likely in the form of H2. Plate tectonic forces must then have cracked the serpentinite which allowed seawater to percolate and leave carbonate precipitates. 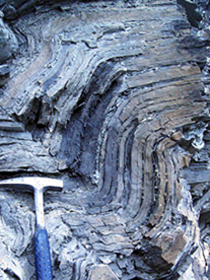 Today, these precipitates appear as white veins crisscrossing the entire ophiolite rock. 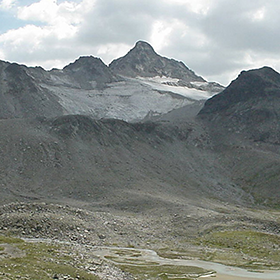 The mountains at Totalp (Schwarzhorn, Totalphorn) and at Fuorcla Champatsch are the result of uplifting and the squeezing of former ocean bottoms between sedimentary rocks that originated from the African and European shelfs of the Tethys during the formation of the Alps. 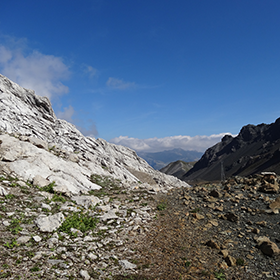 Since serpentinite areas in the higher Alps are still barely vegetated even after several thousand years of weathering, we wonder what prevents soil formation and organisms to conquer them as habitats. 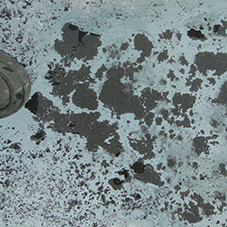 Are the diverse metal compounds still present in serpentine and leached out during further weathering toxic to life processes and inhibit soil-forming biological processes? 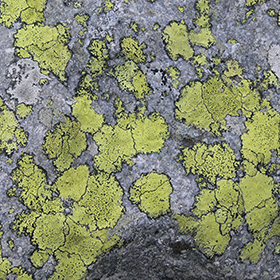 But how do lichens manage to establish thalli on serpentine and even magnetite? 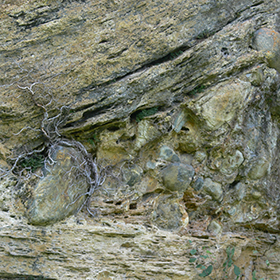 Although soil is being formed on serpentine rocks, vegetation takes a long time to develop. It prefers dolomitic and gneiss areas. 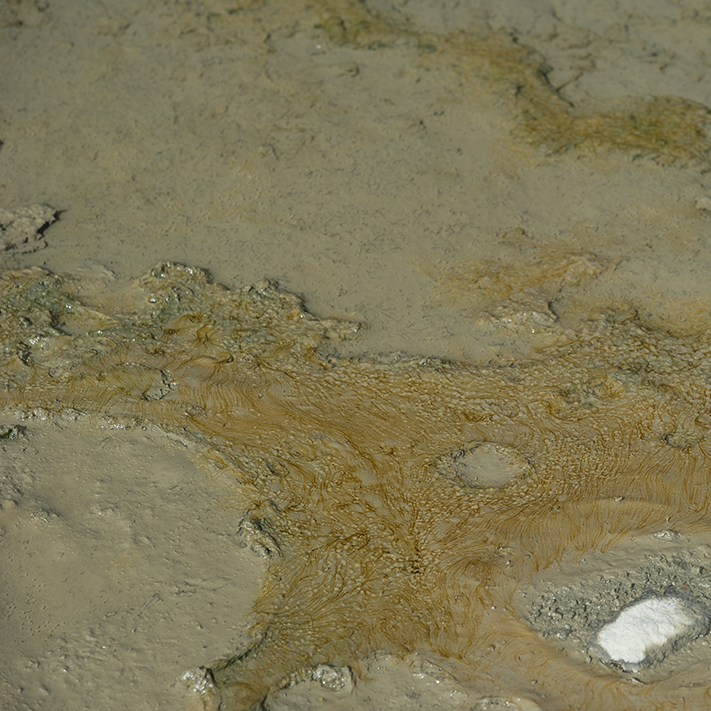 Biofilms, however, seem to flourish rather quickly even in serpentine dominated ponds. 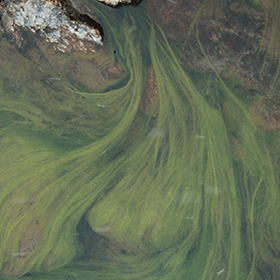 What inhibits vegetation and what promotes aquatic microbes? Key words: Ultramafic rocks, peridotite, chemical hydration, oxidation, hydrogen, magnetite, toxic leachates, carbonation reactions, Magnesite, CO2-sink, microbial serpentinisation communities. 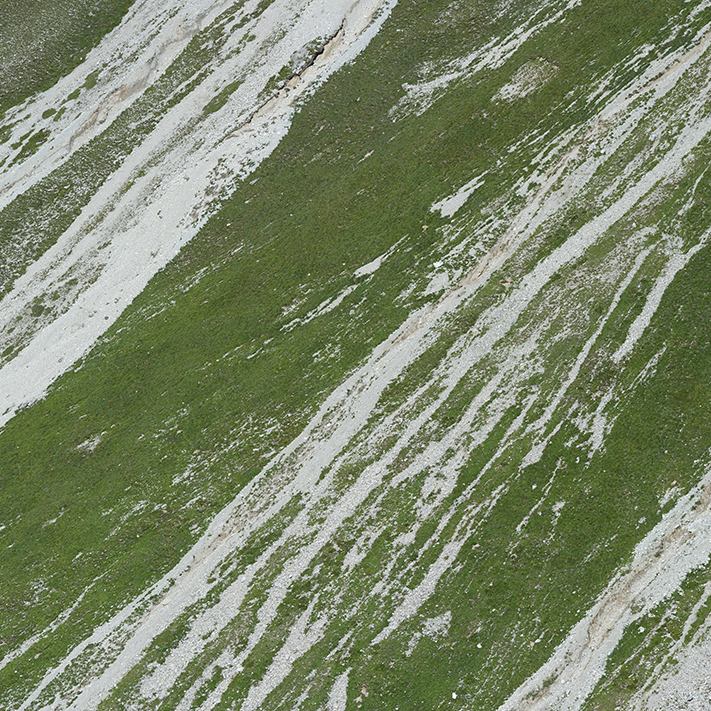 How is Serpentinized Rock (Serpentine) further weathered today? 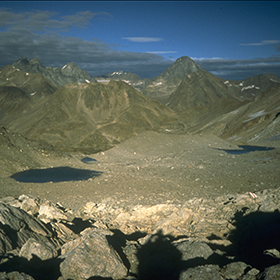 Serpentine fields at Totalp near Davos and Champatsch above Scuol and the presence of pillow lava structures are volcano-sedimentary records for the origin of parts of the Alps. They remind us of once active geochemical serpentinisation processes that occurred when ultramafic rocks from the interior of the earth got in contact with water at plate-tectonic ridges in a former ocean. 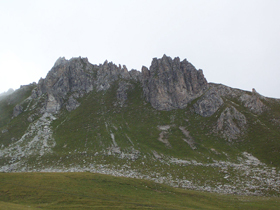 The rocks were uplifted to where they are today during the formation period of the Alps. 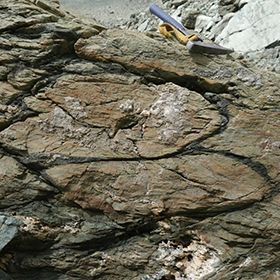 Serpentinisation is the chemical hydration of ultramafic rocks (e.g. peridotite). The reaction produces heat energy and, through the oxidation of mineral components in rocks, molecules like hydrogen, methane and other reduced small carbon compounds which can fuel microbial life. 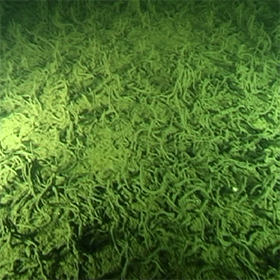 Today, active serpentinisation continues to take place in hydrothermal vents at spreading centres in the deep sea, e.g. at the mid-Atlantic ridge (Lost City), at subduction zones, at uplifted ophiolite outcrops in Oman and in terrestrial and subaquatic hot springs and in deep subsurface crusts. Serpentinisation is also postulated to occur on other planets and moons with tectonic activity. One of the solid products of serpentinisation, e.g. 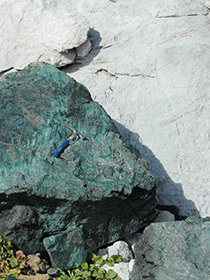 minerals of the serpentine group, can be converted by carbonation reactions into Magnesite which is considered as a natural weathering sink for atmospheric CO2. 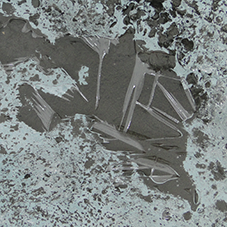 A partially oxidized mineral product of serpentinisation is magnetite which influences magnetic properties of the lithosphere. 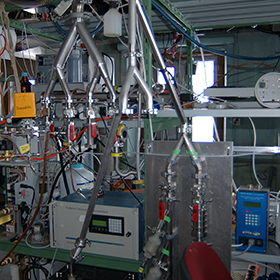 Specialised microbes at active serpentinisation centers gain energy by oxidizing H2, CH4 and other reduced organic molecules with oxidants like O2, SO42- and CO2. As metagenomic analyses indicate, they lay the basis for more complex "serpentine communities", all originally fueled by geochemical processes. Key words: Modern topography, plate tectonics, uplifting, formation of Alps, Tertiary, glacial-interglacial. 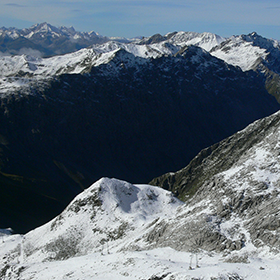 Modern habitats in the Alps are the consequence of ancient tectonic processes which led to today's topography. 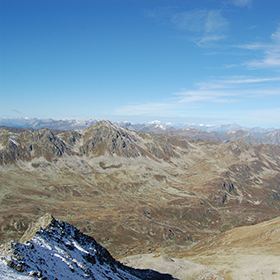 The alpine arc was originally created by the collision of the African continental plate with the Eurasian plate which started an uplift process at the beginning of the Tertiary, about 60 million years ago. 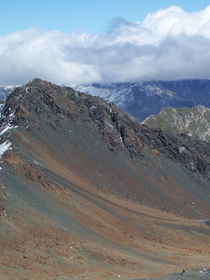 This lead to differently oriented valleys separated by high peaks and steep slopes. 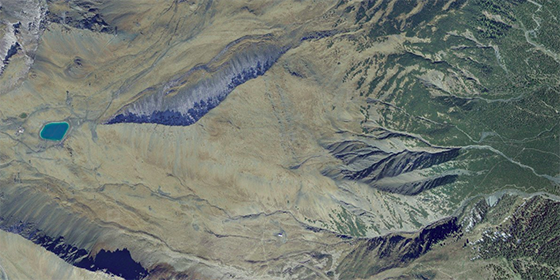 Since the original uplift, the alpine belt mountains have gone through several glacial-interglacial phases and climatic changes during which they have been strongly affected by mechanical erosion and chemical weathering. 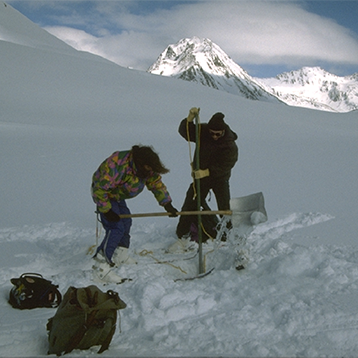 For millions of years valleys and forefield plains were filled with erosion deposits and emptied again when glaciers advanced. They were flooded by lakes and oceans during deglaciation phases which left secondary sedimentary deposits that became rocks when the water level dropped and the valleys drained again. 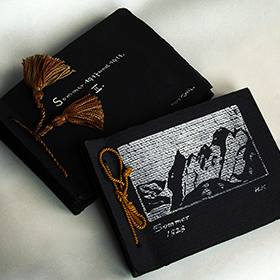 The "landscape record" reflects the history of processes that occurred regionally over different time scales. Various global and regional changes have led to the present shape of the topographic relief over thousands of years. how much is due to tectonic forces? what is the contribution of past glaciation and deglaciation phases? how did and does biology take advantage of these processes? Key words: Orogenesis, mineralogical diversity, magmatic, sedimentary, evaporitic, metamorphic rocks, weathering mobilises, water transports, lithology-characteristic organisms, mineralogical nanoparticles, reactive surfaces, organo-mineral aggregates, units for habitability. 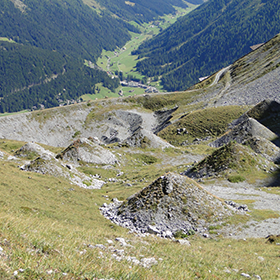 Which Minerals are Weathered in the Silvretta Arena? 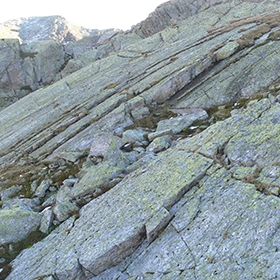 Orogenesis has left a great selection of rock mineralogical diversity in the Alps where metamorphosis, upthrusting and folding have altered the rocks' weatherability and placed them next to and on top of each other. 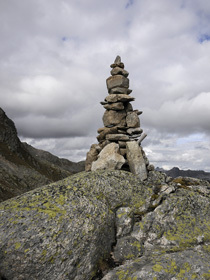 In certain locations different rock types are only short distances apart. 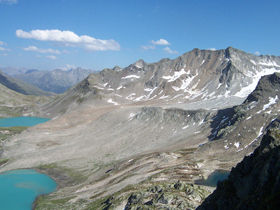 Rocks of magmatic, sedimentary, evaporitic and metamorphic origin are all present in the Silvretta Arena. 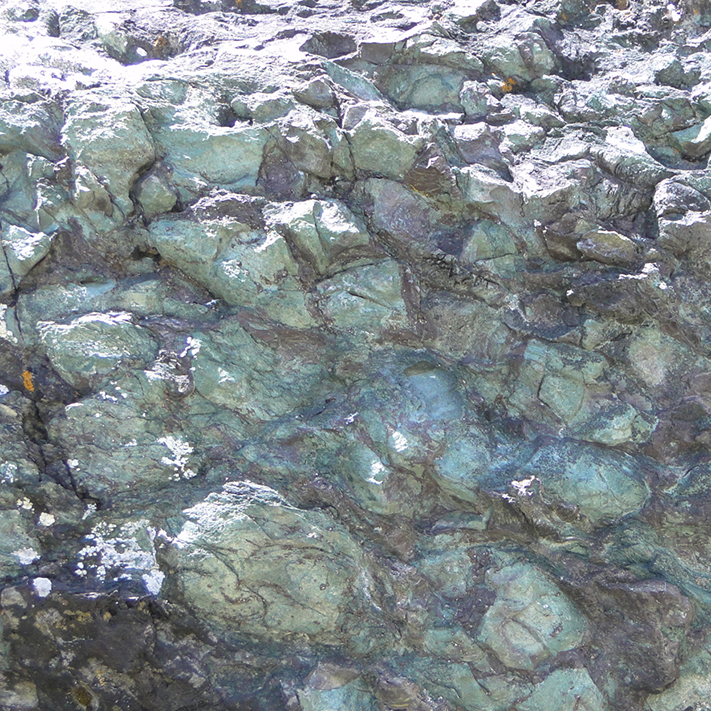 Although metamorphic processes have altered the mineral structure and the physical properties, they have not altered the chemical composition of the rocks. 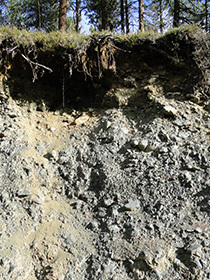 Weathering mobilises chemical components such that different bedrocks can initiate the formation of various types of soils. 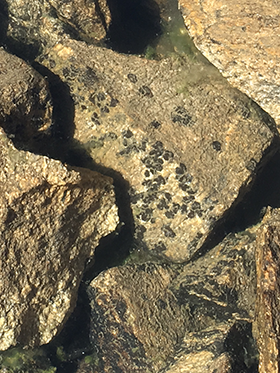 Different rocks also attract lithology-characteristic lichens, soils fungi, mosses, invertebrates and higher plants and, in aquatic environments, algae and cyanobacteria and their syntrophic microbial partners. 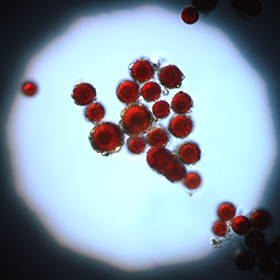 Mineralogical nanoparticles, e.g. 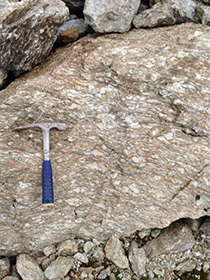 Feldspar, produced by physical erosion and exposed to kaolinization processes contain chemically reactive surfaces which sequester ions from weathering and organics that are supplied to remote areas via the atmosphere. 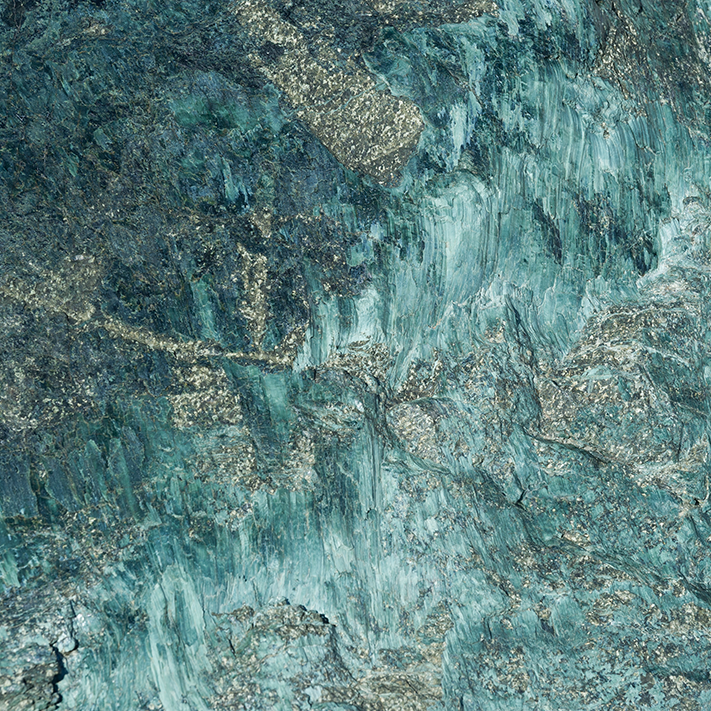 This creates organo-mineral aggregates, the geobiological "units" for habitability and colonisation. Key words: Rock-water interactions, mechanical abrasion, nutrient scavenging nanoparticles, wind erosion, aeolian dusts, ferro-manganous gneiss, weak acids (H2CO3), melting of ice and snow, self-trophication, first signs of life, primary producer, molecular genomic, colored snow, biofilms. 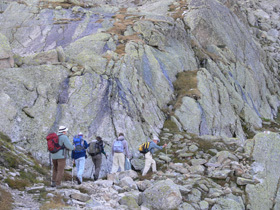 On a macroscopic scale, geologists describe the local tectonics and the origin of rocks and they identify minerals in them. 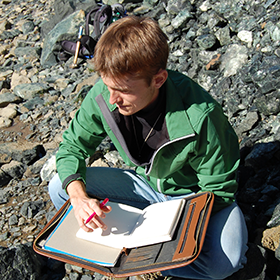 Chemists explore the kind of minerals that are released through weathering and physicochemical abrasion and the composition of aeolian dusts that reach remote areas. Physicists measure the kind and degree of radiation that can affect environmental and biological processes. 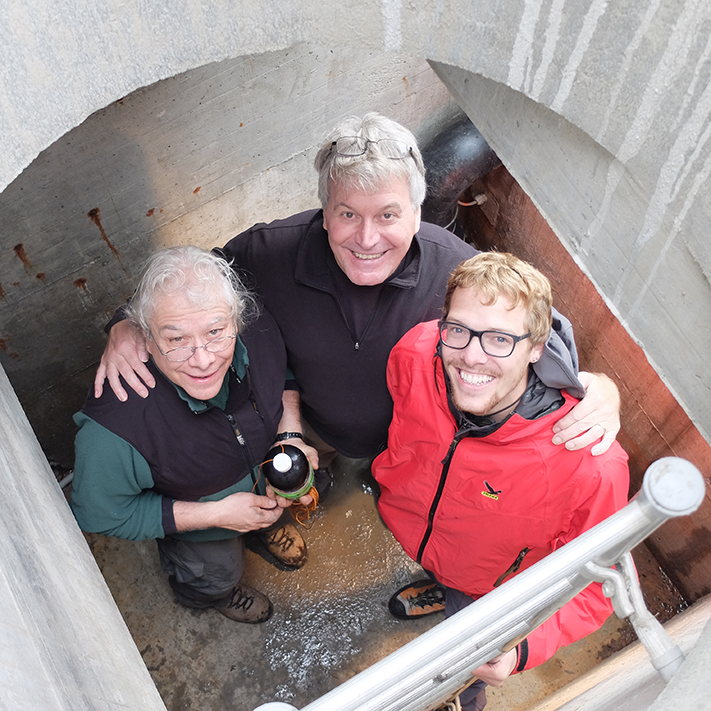 Biologists search for first signs of life in newly released niches and in often rugged and barren landscapes and they study the conditions that promote or limit life processes. 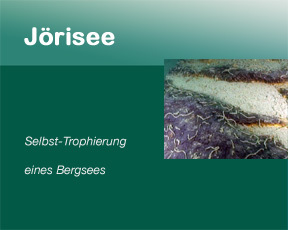 Particular attention is paid to the role of weathering of ferro-manganous gneiss (Fe and Mn-rich Gneiss: Augen gneiss, Zweiglimmer gneiss, Paragneiss, Biotite) which regulates "young", iron-driven, self-trophicating aquatic habitats like Jöri lake XIII. 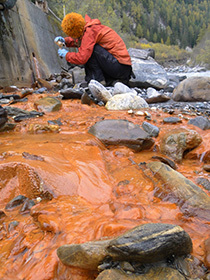 In other course units we study the geochemistry and the role of abiotic abrasion nanoparticles as chemical nutrient scavengers and the appearance of primary producer microorganisms (cyanobacteria, algae) in "new" aquatic habitats in permafrost, in recent glacier retreat ponds, the small connecting rivers and in moraine springs. 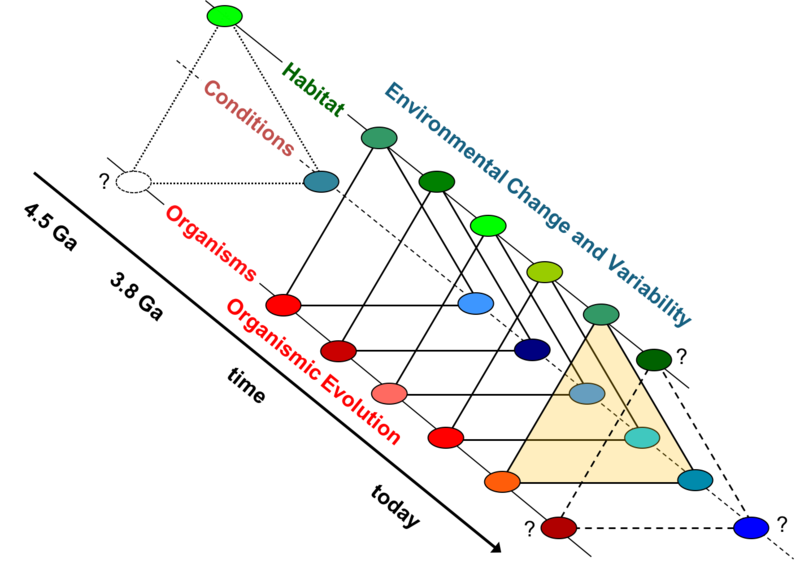 What are the key determinants that make a space habitable and what allows organisms to colonize; what limits or hinders them? Biosphere: Who is there, why are they there and what are they doing there? what kind of metabolic potential do they carry in their genomes to make use of the oligotrophic status of most habitats? 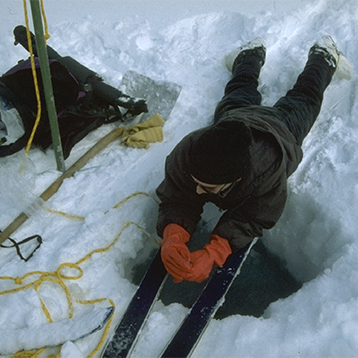 how do they adapt lifestyles when in darkness below snow and ice for several months in winter? 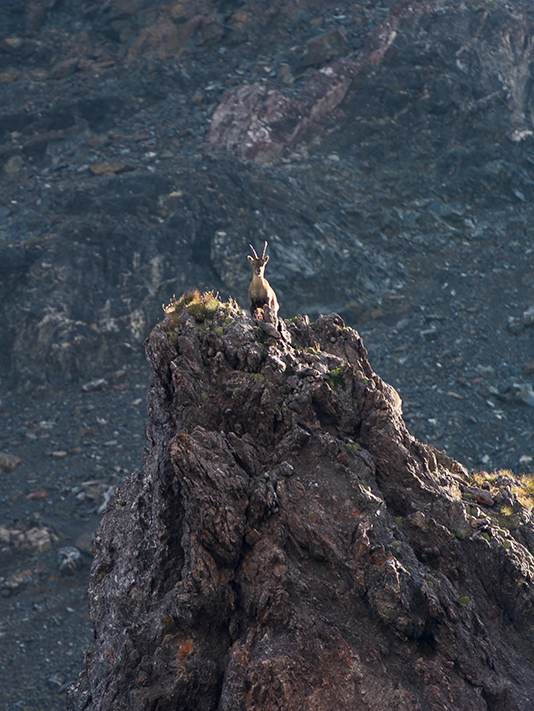 how well can they cope with other harsh and rapidly changing environmental conditions? 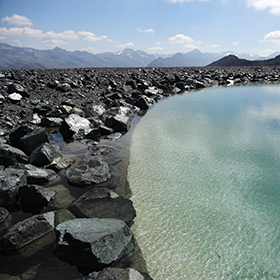 The Silvretta Arena offers ideal sites to study interactions between rocks and water, two key factors that transform barren landscapes into habitable spaces for organisms. 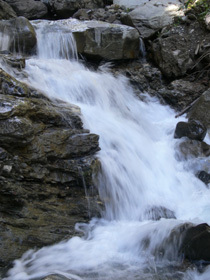 Water is the physical link between the atmosphere, the geosphere and the biosphere. Weak acids (H2CO3) produced by CO2 in the atmosphere, but also strong acids from air pollutants like H2SO4 and HNO3 react with rocks and dissolve mineral components some of which can function as nutrients for the growth of organisms. 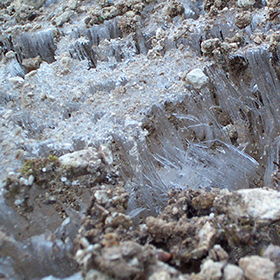 A special form of weathering is melting of ice and snow. 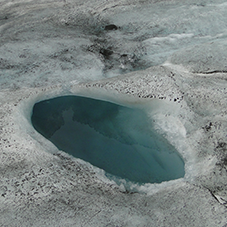 Melting releases components that were stored in glacial ice for decades to centuries. 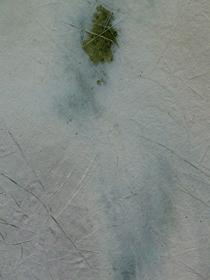 Presently, this archive is literally melting away, the information is lost for ever. Once melt water and an energy source (e.g. light) become available, and if the other necessary ingredients for the formation of biomass (i.e. 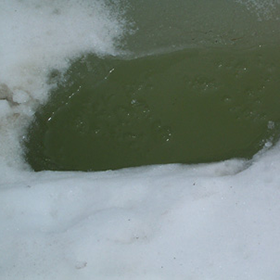 C,N,P,S) are present in the melted ice and snow, cold-adapted algae and cyanobacteria begin to grow. 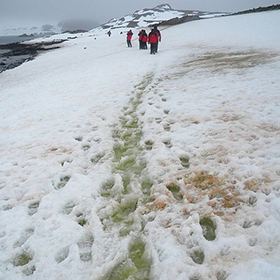 At certain locations they seem to flourish so well that their large numbers color the snow green, red or brown, at others they form dense biofilms with interesting architectures. Key words: Transfer of atmospheric CO2, alkalinity (acid neutralising capacity, ANC), silicate weathering, soil biosphere, metabolic gases, hydrologic cycle. Incongruent weathering of Gneiss at Jöri, Radiolarite at Gotschna and Serpentine at Totalp by atmospheric carbonic acid (H2CO3) acts as a transfer mechanism of CO2 in the atmosphere into bicarbonate, silicate and particulate micas and clays which are transported in streams and settle in lakes. 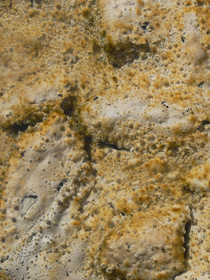 The reaction of atmospheric carbonic acid with dolomitic rocks merely increases the ionic content and the alkalinity of the water and it releases other inorganic and organic components that co-precipitated when the rock was formed. 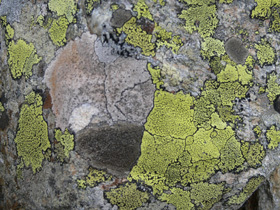 Similarly, the phototrophic symbionts in lichens growing on gneiss assimilate CO2 from the atmosphere while the heterotrophic partners use metabolically produced H2CO3 to dissolve rock components thereby also producing bicarbonate, a process called CO2-sequestration through silicate bio-weathering. 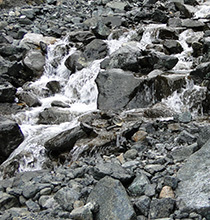 Mineral erosion particles stemming from the mechanical grinding of glacial ice on rocks and the suspended solids from incongruent weathering processes accumulate in glacio-fluvial lakes. The particles adsorb inorganic and organic molecules at their surfaces assuring that many are retained in areas where they are needed for soil formation and fertility. 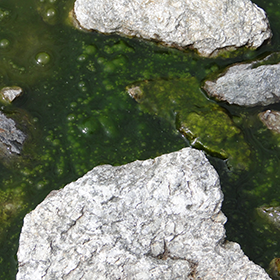 Fine sediments in the photic zones of lakes and ponds are quickly colonized by cyanobacterial biofilms which add the first organic carbon to the habitat. Once inorganic carbon can be fixed sustainably by photosynthesis into biomass, soil formation can be started by the metabolic action of heterotrophic bacteria, fungi, protists, small invertebrates and plants. 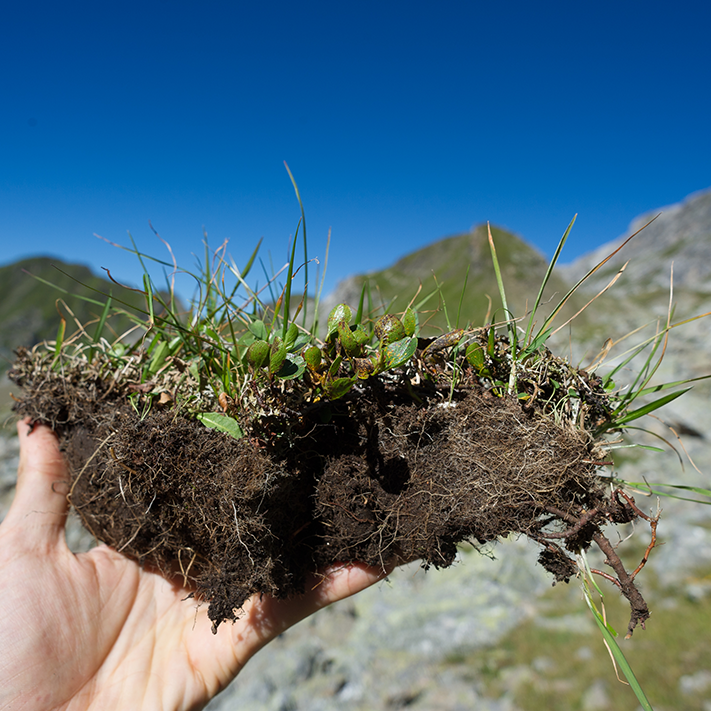 In return, the soil biosphere releases gases and aerosols back into the atmosphere. 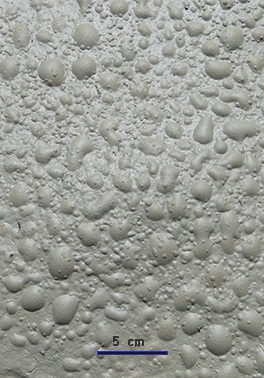 Some of the aerosols can act as nucleation centers for the formation of rain drops and snow flakes and thus close the atmospheric-terrestrial branch of the hydrological cycle in mountain areas. C, N, P, S, Fe and a series of trace elements need to be present in stoichiometrically balanced ratios in order to meet the requirements of forming cellular biomass. The lack of a single nutrient, e.g. phosphate, can inhibit primary productivity regardless of the abundance of other biologically essential resources. Although N2 is plentiful in the atmosphere, due to its low solubility in water and the high biochemical energy demand for its incorporation into amino acids, better soluble nitrate and ammonia are the preferred nitrogen sources. 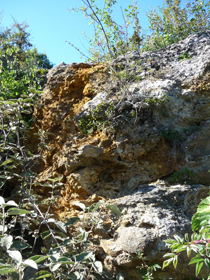 Sulfate originates from the weathering of gypsum containing rocks, but in the early history of Earth reduced sulfur compounds like hydrogen sulfide, pyrite and gaseous sulfur oxides from volcanoes were the more dominant S-sources. 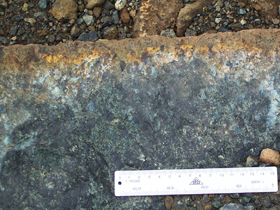 Iron is weathered out of many igneous rocks and leached from sediments. Due to its redox labile chemical behaviour iron oxides can aid in nutrient scavenging processes, a prerequisite for ecosystems to evolve. Biomass production based on the oxidation of inorganic compounds is called photosynthetic primary productivity, if light is the primary energy source, and chemosynthesis, if the primary energy stems from the oxidation of inorganic or organic compounds. Darkness makes it impossible for phototrophic organisms to grow and too much light is inhibitory to the photosynthetic process. 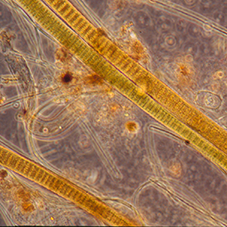 The majority of carbon fixation processes in ecosystems at the Earth's surface are driven by photosynthesis, the ability of chloroplasts, present in most plant cells, and of cyanobacteria to oxidise water to oxygen by capturing photons from sun light. 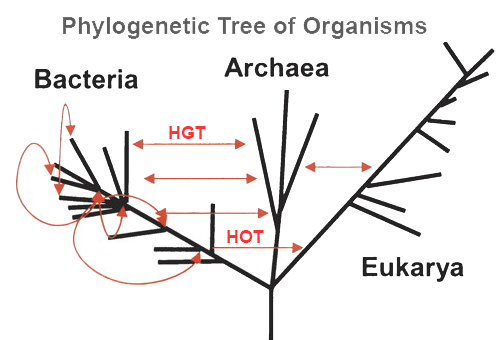 Photosynthesis originated early in Earth history in a number of anoxygenic phototrophic bacteria which can use inorganic and organic compounds as reductants instead of water. 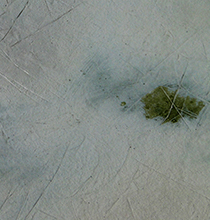 Anoxygenic phototrophs still exist today in particular environments. 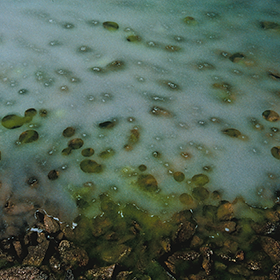 The most versatile oxygenic cyanobacteria require water as reductant, some atmospheric gases (CO2 and N2 as carbon and nitrogen sources, respectively), phosphorus, sulfur and trace amounts of essential elements from mineral dust and rock weathering and light. 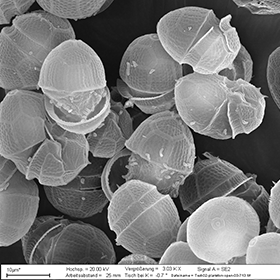 Diatoms and silicoflagellates need Si in addition. More and more CO2 in the atmosphere stimulates its fixation to a certain degree. CO2-fixation enzymes show higher affinities and higher conversion rates of atmospheric CO2 into organic carbon. 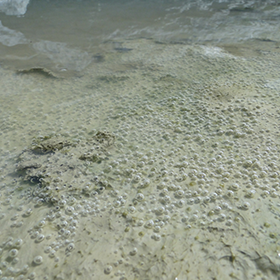 Because CO2 is well soluble in water it can acidify weakly buffered environments which makes life harder for organisms which need carbonate for the formation of their exoskeletons. Key words: CO2-assimilation, decomposition, mineral-associated organic carbon, stability, below-ground carbon, preservation. 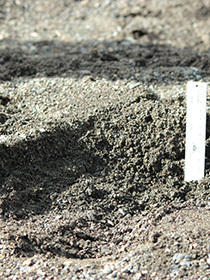 Terrestrial carbon sequestration involves processes that lead to the build-up and maintenance of a stock of bio-organic carbon (OC) in soil and peat. Its cycling is controlled by gains through the assimilation of atmospheric CO2 into bio-molecules and the decomposition of dead organic matter. The soil OC pool can increase over time if assimilation by photosynthesis exceeds losses through dissimilation. Dissimilation is due to the breakdown of biomolecules by exoenzymes and the respiratory oxidation of the bio-monomers by invertebrates and microorganisms which release CO2 to the atmosphere and the hydrosphere. 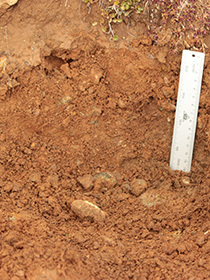 Soil OC associated with inorganic rock minerals, e.g. clays, is more strongly protected from decomposition than unbound OC. In addition, organo-mineral soils more efficiently retain other nutrients besides carbon. This improves soil fertility and promotes the colonisation by plants which allows ecosystems to evolve more quickly. 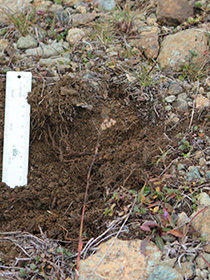 Soils with a high mineral to carbon ratio, as is common in glacial forefields, have a greater disposition for carbon sequestration than more developed soils that already have high OC contents. 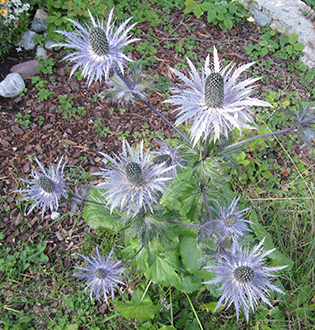 Perennial plants (grasses, some dicot flowering plants, mosses, shrubs, etc.) 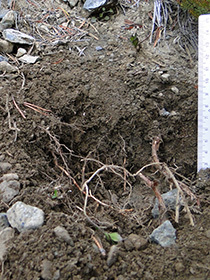 are the more persistent contributors to soil OC than ephemeral ones, because the organic matter which is produced by some of them forms sub-surface roots and rhizomes and their woody parts persist over longer time periods. 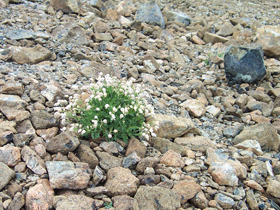 The carbon from the litter produced by above ground plant organs � leaves, petals, stems, etc. 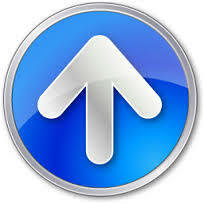 � is turned over rapidly and has a low preservation potential. Extensively managed pasture lands in the semi-arid belt above the forest tree line and below the nival zone often contain high soil carbon stocks. 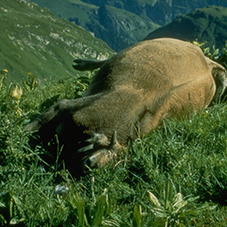 The native grassland vegetation at these altitudes allocates a large portion of its photosynthetic products to below-ground organs. In addition, since the high-altitude pasture lands are used by grazing cows, goats and sheep for only a short period during the summer and are left untouched during 9 to 10 months every year. 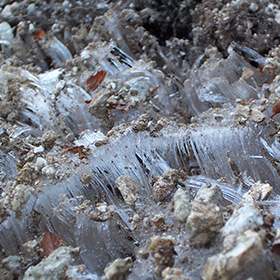 During most of the winter months degradation in the cold ground is minimal, thus plant-derived soil OC can be preserved well. Key words: Nutrient distribution, cascading lake systems, fertilisation, biofilms, assembly of producers and degraders, recycling, biogeochemical cycles. 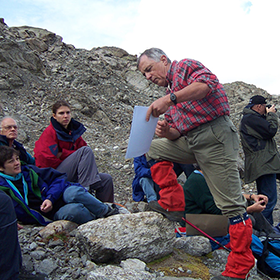 In some high mountain i-ESS courses we study responses of basic geological, geochemical, physical, atmospheric, hydrological, limnological and microbiological processes under today's rapidly and drastically changing environmental conditions. "Bio-geo-chemistry" describes the interplay between the chemical weathering processes which dissolve molecules from the lithosphere (rocks) and how they can become nutrients, and possibly energy sources, that drive life in these initially oligotrophic high mountain habitats. 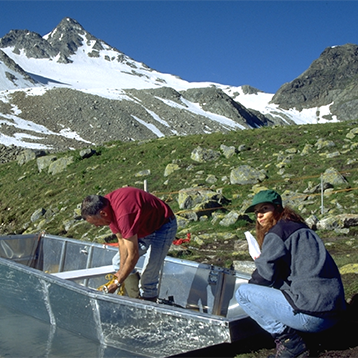 In the Jöri catchment, we illustrate on a macroscale how carbon and nutrients are acquired and distributed via cascading lake systems and the metabolism and productivity of connecting creeks from the melting glacial ice to the lowest lake in the headwater drainage basin. 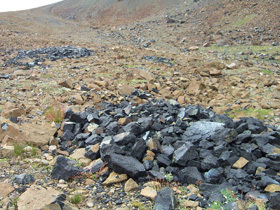 We wonder how N, P and S get into an area whose rocks do not contain these elements in their minerals and speculate about pollutant salts, produced in the atmosphere, like (NH4)2SO4 and NH4NO3, N2-fixation by diazotrophic microbes and phosphate carrying soil dusts as modern fertilizers in remote pristine areas. Once there, nutrients need to be sequestered and efficiently recycled in order to build the basis for a sustainable ecosystem. This is assured by the microbiome. 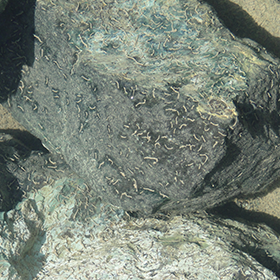 Microorganisms are the first to colonize new aquatic as well as terrestrial habitats. 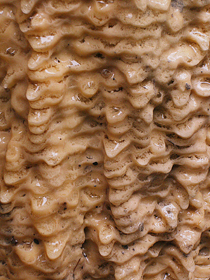 While growing they form large amounts of biomass which tends to assemble in mats and biofilms. The necessary resources for life are thereby scavenged by biochemical processes into bioorganic macromolecules of living cells. Biofilms are assemblages of a great number of microorganisms which coexist in close metabolic interdependence between primary producers and degraders. Through their metabolism they drive short biogeochemical cycles in attached as well as in planktonic life styles. Key words: Biofilms, benthic zone, mesotrophy, pelagic zone, oligotrophy, toxicity. Suspended colloids, nanoparticles, surface structure, chemical reactivity, catalytic function. 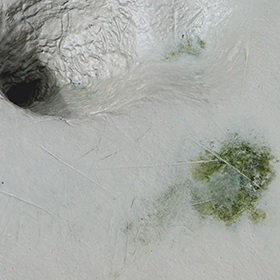 Cryoconite holes, psychrophilic lifestyles. 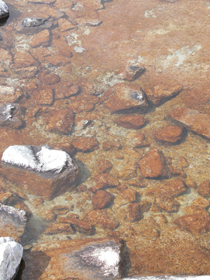 Mineral springs, ligand-based solute exchanges, reduced ions, lithifying environments. 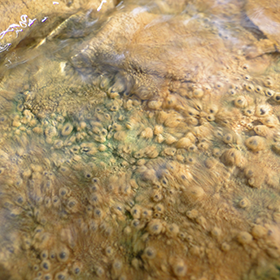 We observe biofilms in attached life styles (sessile) on rocks in streams where they have to withstand strong hydraulic shearing forces as well as on sediments in the photic zone of glacio-fluvial forefield ponds and catchment lakes. 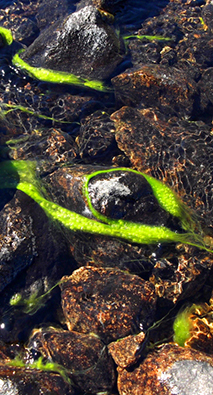 We wonder when and why these predominantly cyanobacterial biofims can become toxic for higher forms of life, e.g. 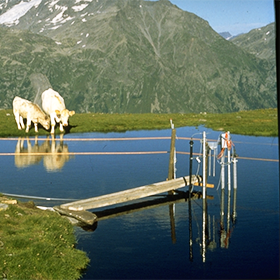 cows grazing on nearby meadows and drinking the pond water. 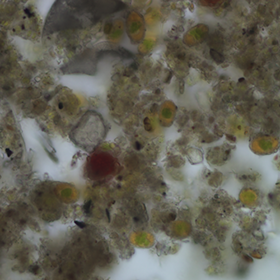 Toxin production seems to be initiated, if cyanobacterial biofilms are switched from a bentic, nutrient-rich, to a pelagic (oligotrophic) life style. 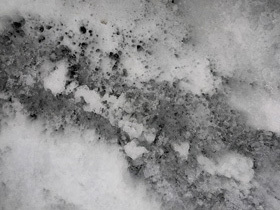 Obviously, the organisms present in bentic biofilms were selected based on their fitness to flourish and survive under high-nutrient, high radiation conditions, and for their ability to withstand large temperature fluctuations and long periods of darkness below snow and ice. But how does the microbiome as a whole respond to changing environmental conditions and how do low-nutrient conditions induce in some of its members the production of the structurally complex molecules that are so extremely toxic to higher forms of life? 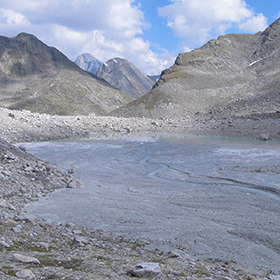 While ice of the Silvretta and J�ri glaciers is grinding on the base rock it produces millimeter- to nanometer-size abrasion particles some of which settle in forefield flood plains. These sedimentation basins are locations where nutrient ions are sequestered and where organic carbon might get formed. 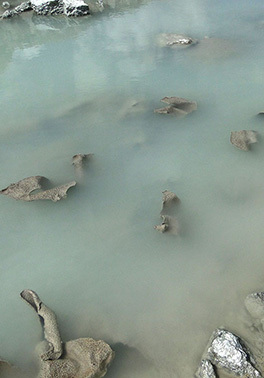 They represent the first habitable spaces for lithotrophic and organotrophic microorganisms. 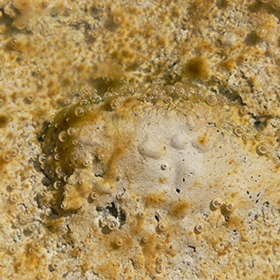 Erosion micro-particles might also be involved in producing the starting chemicals for abiotic syntheses of small organic molecules which might form the link between rocks and life. The detailed physical surface structure and the chemical reactivity of these particles which defines their specificities as possible catalysts for the production of highly reactive radicals is not known yet, however. 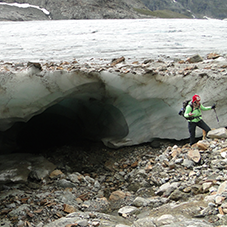 On the surfaces of glaciers, where ice forms and melts, we touch on topics about life in freezing cold cryoconite holes and on melting snow. In areas with igneous, metamorphic and sedimentary bedrocks we follow the chronology of soil formation, primary colonization and vegetation diversity under the various habitat settings and spatially different habitability criteria. 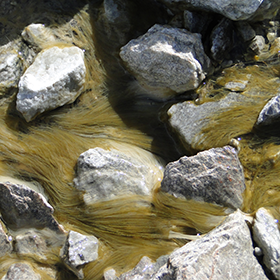 And in mineral-rich springs that emerge from shales in the Lower Engadin Window we follow lithification of microorganisms and how they are escaping suicidal encrustation. The primary producers and their syntrophic symbionts have high genetic plasticity and phentotypic adaptability. This allows them to switch their life styles as conditions change which makes them well adapted to high-altitude environments. 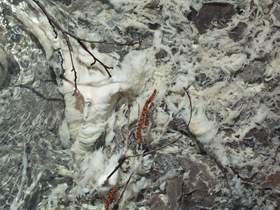 Under certain conditions they even develop planktonic blooms in mountain lakes, form dense biofilms (mats) on rocks and on sediments or thick undulating filamentous veils in flowing rivers. The primary producers and their syntrophic symbionts have high genetic plasticity and phentotypic adaptability. This allows them to switch their life styles as conditions change which makes them well adapted to high-altitude environments. 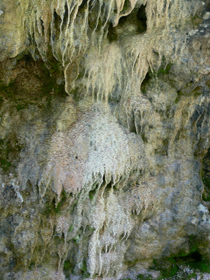 Under certain conditions they even develop planktonic blooms in mountain lakes, form dense biofilms (mats) on rocks and on sediments or thick undulating filamentous veils in flowing rivers. Biofilms on different substrates with diverse organismic communities and interesting architectural structures. 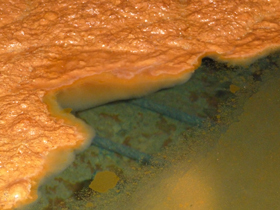 Biofilms are the preferred life style in harsh and frequently perturbed environments. 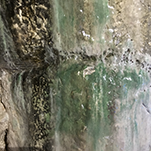 They adhere to surfaces through holdfasts or assemble in biofilm networks that "glue" themselves to rocks and sediments with slimy EPS (exopolymeric substances). Recycling of Nutrients by Short "Biogeochemical Pumps"
Key words: Microbial mats, biofilms, biotic, abiotic processes, phototrophic cycling, light, biotic and abiotic cycling, darkness, colloids, particle surfaces, efficient nutrient retention. Phenotypic flexibility, metabolic switch, mixotrophic lifestyles, nutrient disturbances, mixing, blooms. 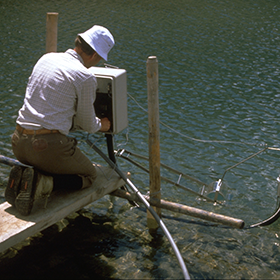 Biologically driven recycling that oceanographers refer to as the "biological pump" is functioning similarly in high-altitude lakes and, on a microscale, in microbial mats and biofilms. 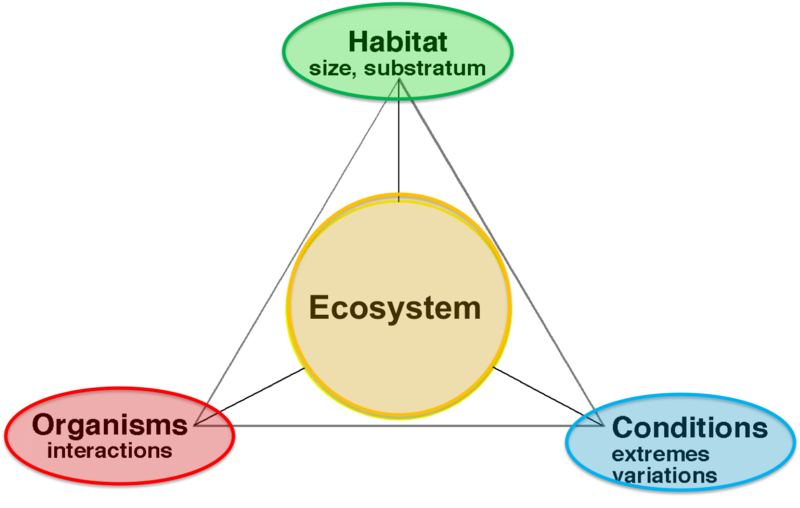 Here, the nutrient cycle involves a combination of biotic and abiotic processes. Biological cycling takes place during the productive summer months, while nutrients are retained in organic detritus, on inorganic surfaces and colloids in the absence of assimilation, i.e. in the darkness of winter. Since most high-altitude ecosystems are oligotophic, the use, retention and reuse of resources must be quick and highly efficient. Diffusion and mixing distances are short and scares trace nutrients are sequestered and kept back by chemically reactive rock abrasion particles, weathering colloids, ferric iron oxyhydroxides and organic ligands. 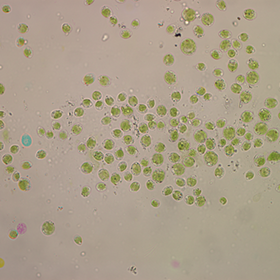 Thanks to the elements sequestered on surfaces of the nanoparticles, primary colonizer organisms (cyanobacteria, diatoms, dinoflagellates, Hydrurus sp., Chlamydomonas sp. and a number of other Chlorophyta) can express metabolic functions like photosynthesis, dinitrogen fixation and ferrous iron and sulfide lithotrophy. 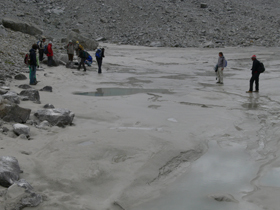 Transporting erosion particles in melt water from glaciers to lakes will diminish as glaciers shrink and they will no longer be supplied once a glacier has disappeared completely. 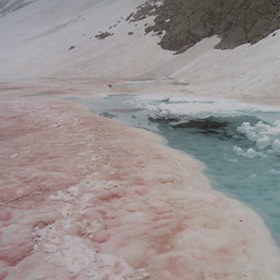 The changes in the hydrological regime of an ice-free catchment will drastically impact the development of river and lake ecosystems and the kind of organisms that will then be able to colonize them. Key words: Geoeconomy, nature's services, food, health, wellness, forestry, protection, global change, shifting nutrient cycles, lack of water, land use changes, agriculture, tourism, mineral water springs. 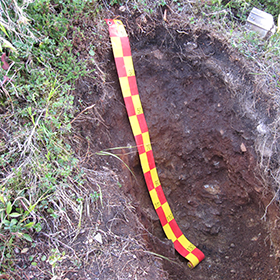 Observations in populated settlements make us aware of how our ancestors began to use nature's services for health, wellness, agriculture, forestry and protection. 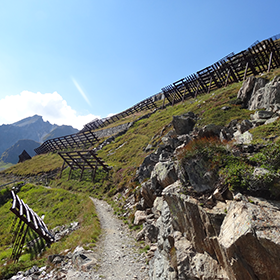 Course units for particular interest groups address questions about the sustainable and economic use of high mountain meadows for agriculture and how changes of the environmental conditions, e.g. the lack of irrigation water, might lead to shifting nutrient cycles, soil fertility, plant community composition and land use patterns. 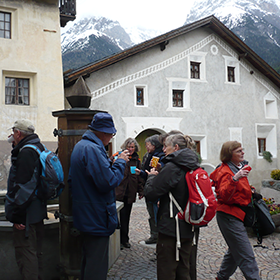 In the Lower Engadin Window, we touch on the mineral-rich springs - hydrogeochemical phenomena in triassic marine shales - and their value to historical and modern wellness desires, for health and for modern event tourism. 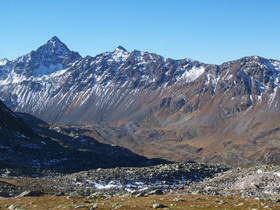 Geohydrochemistry had and has an enormous impact on the ecology and socioeconomy of the mountain valleys in the Silvretta Arena. 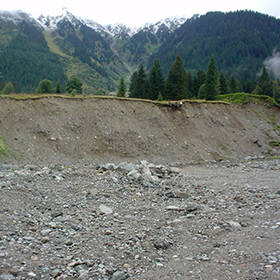 Key words: Mountain hazards, abandoning settlements, changing climate, changing attitudes. 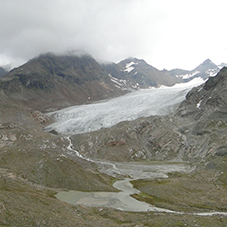 Course units on geomorphology and landscape evolution processes at formerly glaciated high altitudes are linked to hydrological changes and to man-made and natural hazards. 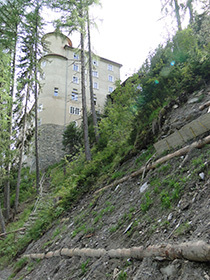 If appropriate, we include units on both, preventive measures and landscape recovery after destructive natural events. 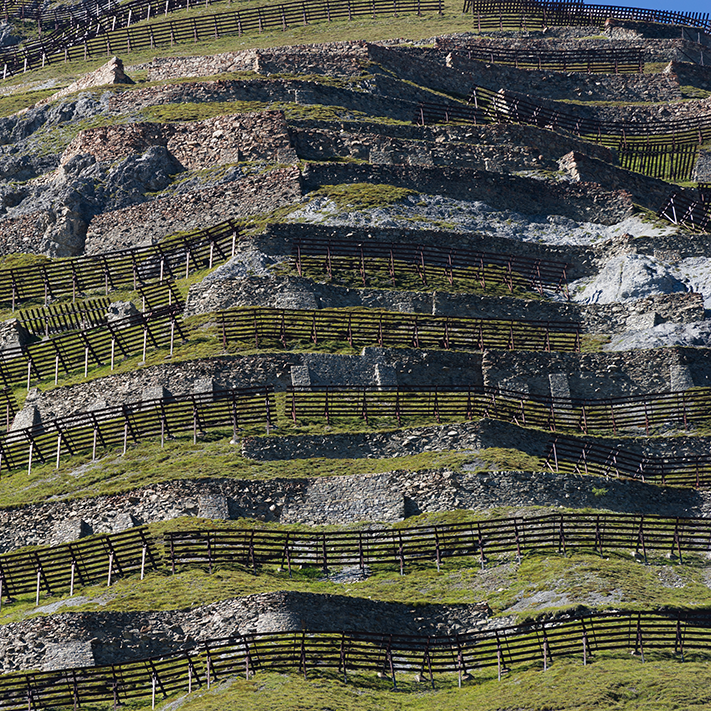 People settled in mountain areas centuries ago. 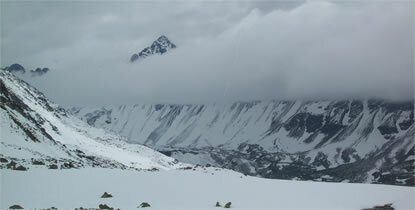 Although they experience natural hazards again and again, these have seldom been reasons to abandon mountain valleys. The residents adapted or took measures to minimise the dangers, made their area saver, developed it further and took a statistical view on the likelihood that a disastrous event would hit them again in the near future. Will the projected global and local climate change impact scenarios change their attitudes? How far into the future will they consider environmental variation? How resilient are their agricultural practices, their tourism industry and other economic fundamentals? 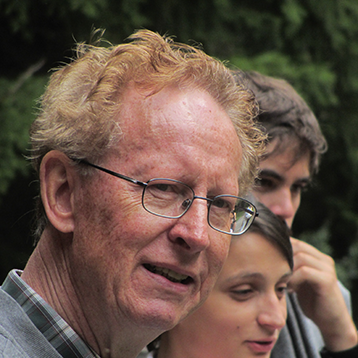 How are past experiences considered in societal decision-making processes? Key words: Ecological opportunities, evolution of new habitats, sample collection, laboratory analyses, historical references. We aim to organize existing knowledge, deepen our understanding of Earth's dynamic history and promote awareness about consequences of rapid environmental changes to its further evolution. We see changes as ecological opportunities for the creation of "new" habitats and we encourage curiosity-driven hypotheses aimed at wanting to know more about the impact changes have on the evolution of habitable spaces. But we also discuss about protection from foreseeable dangers. 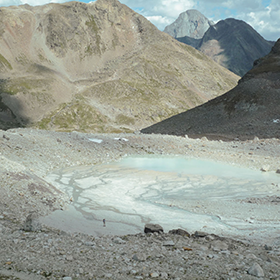 We project scenaria about how the landscape could look like once all the ice of the Jöri glacier has gone and about the hydrologic changes in a catchment without ice melt water. We connect different scientific fields in interdisciplinary lecture series and seminars where we exchange knowledge based on insights from research results. In creative design sessions new ideas are summarized into collaborative study themes that could lead to new research projects. And we search for effective ways on how to transform scientific findings into understanding changes in our environment and how scientific insights can become useful for decision-making processes. 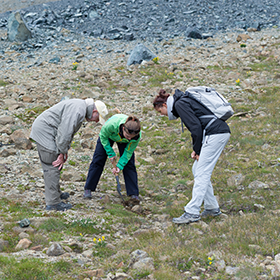 During the i-ESS courses, some students collect rocks, sediments, water or biological samples which they later analyze in the laboratory as practical exercises or as part of an attractive thesis project or as small semester practical. Others study historical reports about the location or search for aerial photographs, maps and satellite images for comparison of landscape developments over past decades and for the design of disaster prevention models. 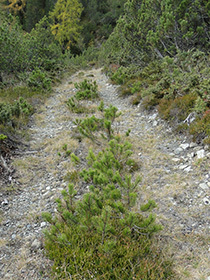 And again others search for scientific and historic literature that help understand the functioning of biogeochemical mass fluxes and cycles in newly evolving habitats and aspects of fertilization with airborn nutrients, the sequestering of carbon in remote ecosystems and the drivers for ecosystem functioning and adaptation under the extreme and seasonally variable environmental conditions. 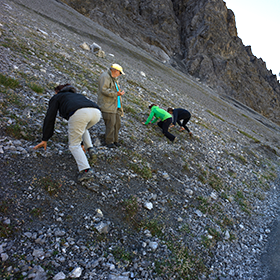 Reporting back, publishing scientific articles and documenting observations in artistic photographs and short videos will remind present and future course participants and the interested public about the many insights into scientific topics that become apparent when we observe nature in the Silvretta Arena. 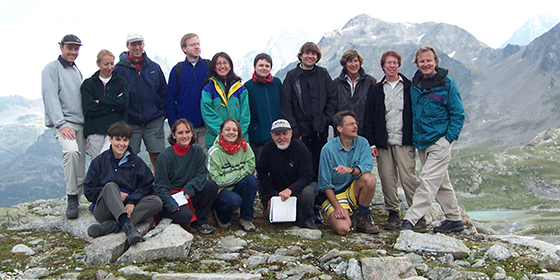 Several innovative research projects emerged from course activities over the past decades. A series of best pictures which illustrate this webpage stem from course activities and follow-up research projects. They give interested students ideas about what to expect. 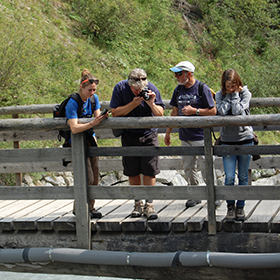 By the end of a course participants will be able to explain for many pictures where they were taken, what they illustrate, why we went there and which phenomena we studied during particular field trips. If the weather allows, you will have assembled a similarly instructive collection of pictures to illustrate numerous geo-biological and geo-ecological phenomena to others. A few examples of Topics for Discoveries and the available Field Guides are listed at the bottom of this page and in OLAT, respectively. 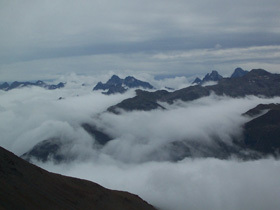 Mountain areas are particularly responsive to changing environmental conditions. World-wide temperature increases, for example, have led to dramatic decreases of alpine glaciers and to the thawing of permafrost ice. This created new landscapes and opened up new habitable spaces. The changes can be reconstructed most impressively by comparing today's state of the landscape with geographic maps and aerial photographs from past times. 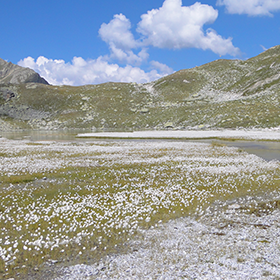 For organisms that live in alpine habitats, strong fluctuations in seasonal weather patterns have always been selecting forces favoring those that can best cope with climatic extremes. They are already here and some might successfully colonize the "empty" spaces that become available. Open questions are: how they got here; how quickly they can conquer new habitats and which conditions make "new" spaces habitable. 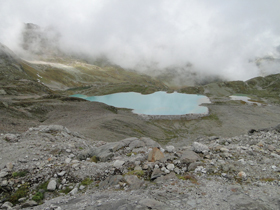 High-alpine ecosystems are zones where one can study how plants migrate to higher altitudes, how quickly soil formation takes place in deposits of glacial flood plains or in former permafrost areas, how weathering of freshly exposed rocks influences geochemical cycling of macro and trace elements and which organisms first colonize "newly born" glacial lakes. Of particular interest are sources of biologically important trace metals for nitrogen fixation and photosynthesis (Mo, Ni, Zn, etc.) and their sequestration and availability to pioneering organisms. 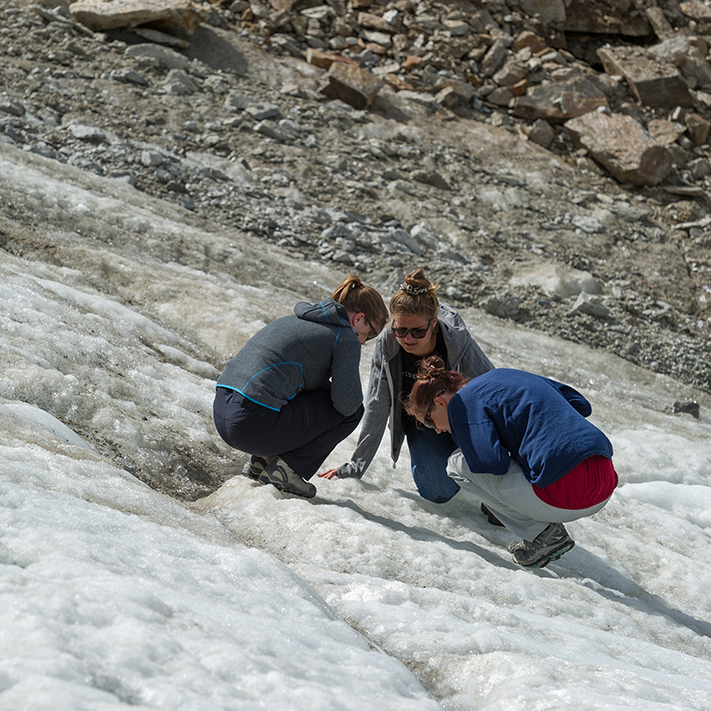 During one of the field course sections on "Alpine Microbial Ecology and Geochemistry" we address the importance of these questions in the context of changing global climate scenaria and the impact the answers have on an evolving high altitude biosphere. Reading rocks also allows us to reconstruct past habitats and the conditions that might have supported or limited life in them. 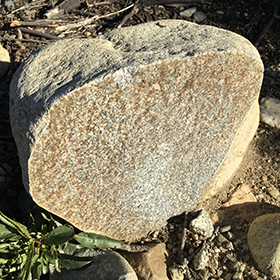 In serpentinite areas we still wonder, why there is such sparse vegetation when compared to the one on soils above gneiss, radiolarite and dolomite bedrocks at similar altitudes and exposures. 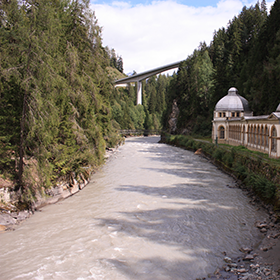 The terrestrial hydrological cycle, which begins in the central mountains of the Swiss Alps distributes water by 4 major river systems across much of the European continent: Rhine, Rhone, Inn-Danube and several alpine rivers that feed into the Mediterranean Sea. 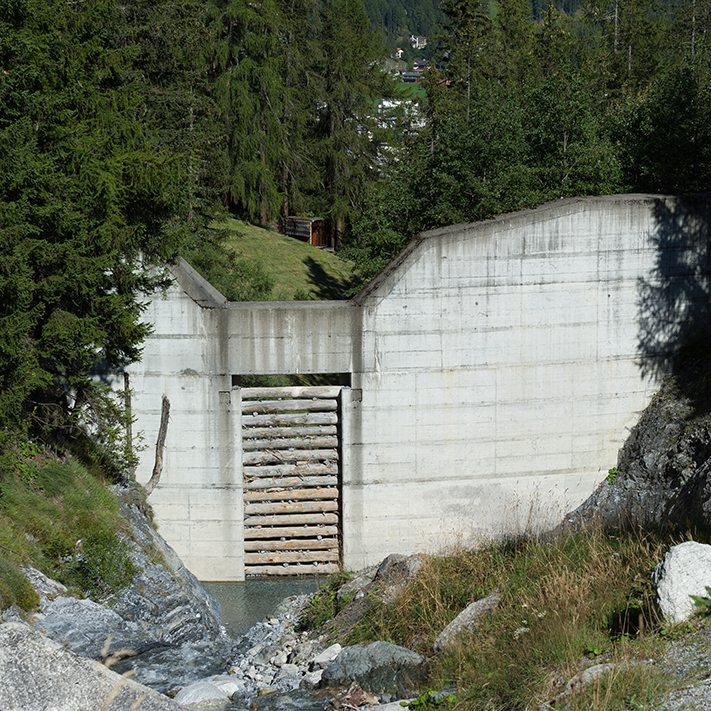 Millions of people in Europe depend on water, which originates in the Alps for drinking water, power generation, transport, industrial purposes and recreation. 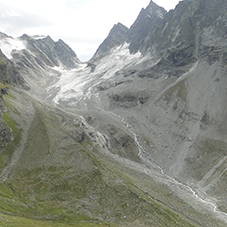 We address critical issues like long-term water availability and phases of dryness after the glacial ice has vanished. And we point out where economic interests have considered ecological fragility of high-altitude ecosystems and where this has not happened. 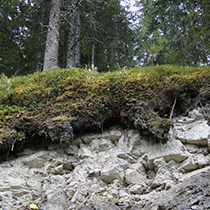 We will experience a great variety of geomorphological landscapes representing earth endogenic processes, like intrusions (Totalp, Champatsch), uplift, folding and overthrusts (Silvretta nappe), on one hand, and more recent landscape-forming exogenic events like glacial and fluvial erosion, melting of glacial ice, basin deposition, sedimentation (Jöri catchment), and in the Lower Engadin Window, local cycling of organics and the release of trace elements during rock weathering; gas ebullition in mineral springs and the formatiion of new carbonate minerals that precipitate from oversaturated solutions emerging from triassic shale deposits. 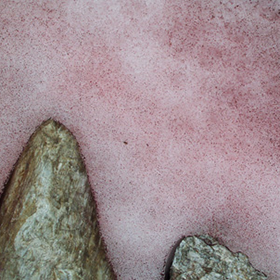 The first colonizers in alpine environmental settings are those that have the greatest "evolutionary experience" in withstanding short term fluctuations and long term environmental changes: the microorganisms. They play vital roles in sequestering nutrients, fertilizing soils, weathering minerals and regulating the cycling of carbon and other essential elements. 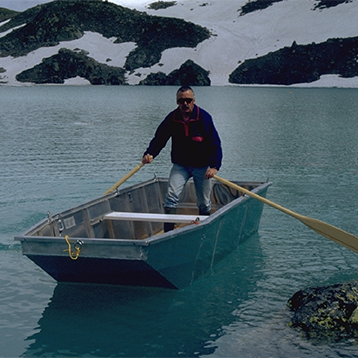 in high mountain lakes, swamps, rivers and soils we ask: what is needed for them to grow; what cellular features are needed to adapt best to the extreme and rapidly changing conditions; but also how organisms got and get here, and how microbes in particular, influence climatic changes through the production of metabolic gases and the removal of climate-changing gases from the atmosphere. 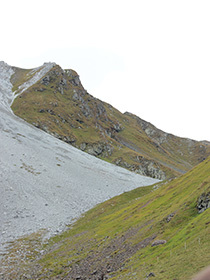 High Mountain areas are living laboratories and lecture rooms under the open sky where consequences of global changes can be observed and studied. 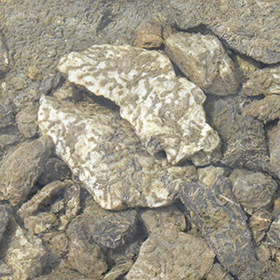 A few examples: Rocks contain minerals that serve microorganisms as nutrients, sometimes as energy sources; wind and ice erode mechanically and water weathers; glacial rivers distribute erosion and weathering products to various lakes and sedimentation basins; certain lakes are still under the influence of "rock flour", others are no longer affected by it. 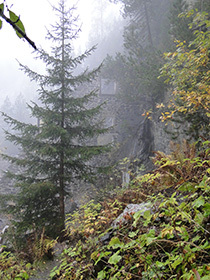 Physical and chemical conditions determine whether or not a particular location can become a site for organisms to thrive. The images on this site illustrate the diversity of geobiological habitats, numerous landscape settings and environmental processes and conditions, which we will meet during our field studies. 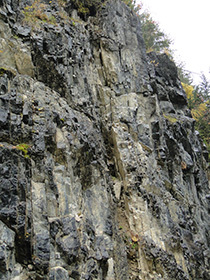 On the field trips we will walk across serpentinite rocks from former intrusions, along carbonate-serpentinite contact zones, shales and schists that once formed as organoclastic sediments in the Tethys ocean, carbonates that precipitated along the shelf of the "African" side of the Tethys, and on pigmented radiolarite sediments and gneiss nappes. All these sites tell stories about former habitats and changes that occurred over time. At the different locations we will follow the influence of bedrock weathering on soil formation, on the vegetation cover and on aquatic and soil ecosystem evolution. 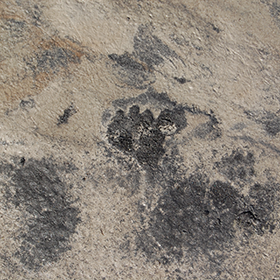 Wherever we stand, on dry soil, on ice or snow, at the edge of a lake or on old magmatic or sedimentary rocks, we will almost always find traces of life. Asking why there is life where we find it and how organisms make a living where they are, are central aspects of our geobiology investigations. 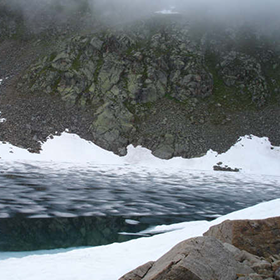 The water in the high-altitude Jöri Lakes originates from rain, snow and ice-melt, which makes the lakes interesting for studying the quantitative contribution of airborne natural components and pollutants to the chemical composition of the pristine water. 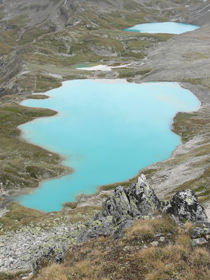 On the other hand, the high density of erosion particles and colloids with long floating times, that give the lakes their beautiful color, act as scavengers of pollutants, but also of mineral nutrients, organics and even pollutants that were preserved in glacial ice for a long time and are released today. They all play vital roles in ecosystem fertility and in sediment and soil formation. 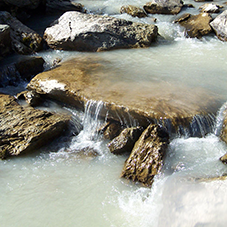 Water that stays in contact with sedimentary rocks for a long period of time often contains high concentrations of ions that were exchanged from the ancient rock-forming sedimentary particles. 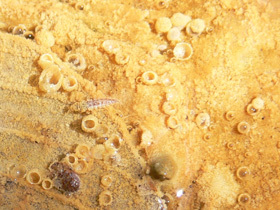 Some of these fossil solutes act also as nutrients for modern microbial communities that establish themselves at spring mouths. 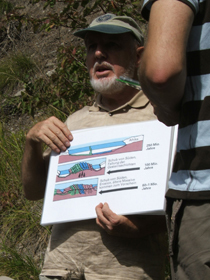 During the field course, we can illustrate how microorganisms respond and adapt physiologically to the complex interactions between chemical, geological and atmospheric determinants in the lakes of the Jöri catchment, in mineral springs and in subsurface mine waters. 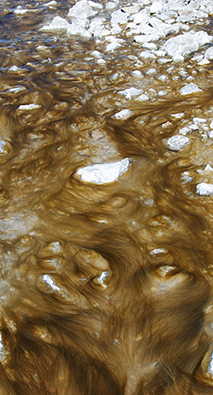 With these topics we intend at contributing to efforts aimed at understanding evolutionary processes in earth history and the microbial diversity in extreme environments. 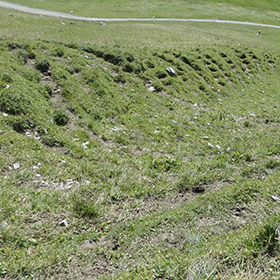 Cycling and re-use of resources are key principles in Earth's biosphere. 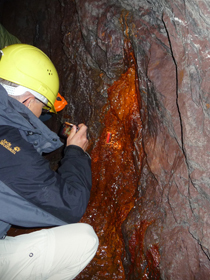 At various field sites, we observe alterations of surface phenomena which relate to underground and surface geochemical cycles of iron, manganese, sulfur and carbon (Alvaneu, Rothenbrunnen, Rablönch, Jöri, Gonzen). 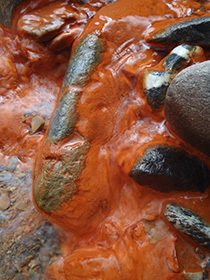 Often ferrous iron and / or sulfide oxidizing bacteria develop in masses at anoxic-oxic transition zones. 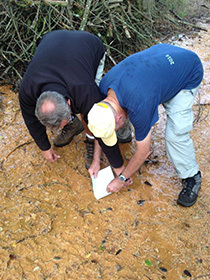 We will study the conditions that must prevail to select specifically for the kind of microorganisms, which are present in these aquatic habitats. 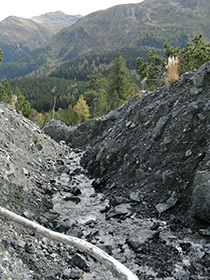 At some field sites we illustrate the quality of the water when it arrives as rain or snow in the Alps, we investigate how it gets stored and transported and how its chemical composition changes while it percolates through different rock formations (Rauwacke, Gypsum, Bündnerschiefer, unconsolidated Gneiss rock debris in glacial moraines). 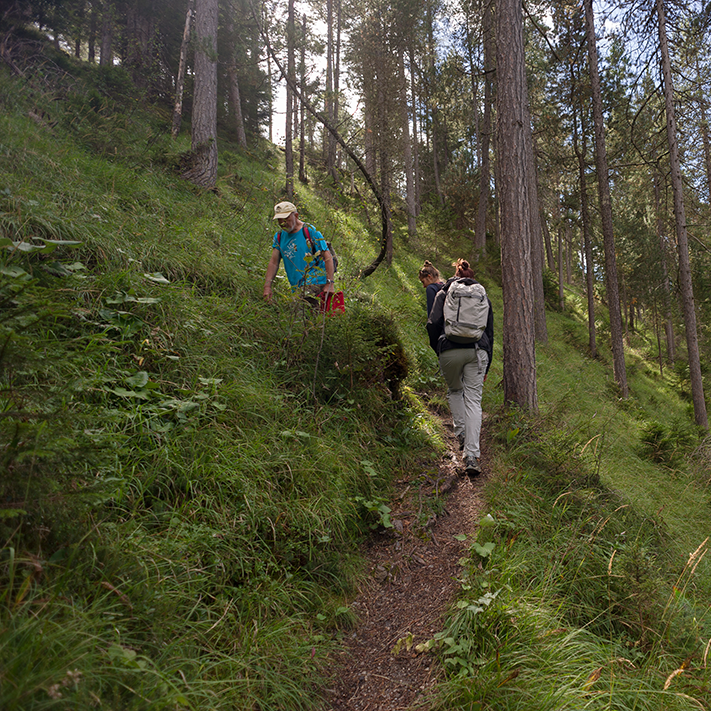 These topics can be illustrated at different locations in the headwaters of the Rhine and Inn rivers (Rothenbrunnen, Alvaneu, Scuol-Tarasp, Val Sinestra). 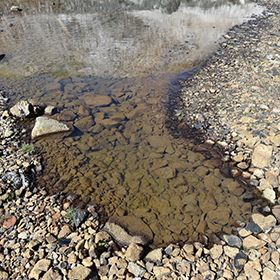 We focus on the chemical composition of a variety of spring waters and follow how these can create a diversity of ecosystems for microorganisms. 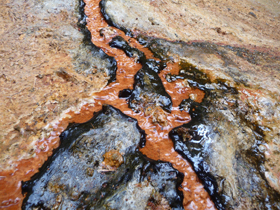 Often, the solutes present in spring water not only represent the water-soluble mineral components of the rocks, they also carry a signature of microbiological processes, which take place in the subsurface. 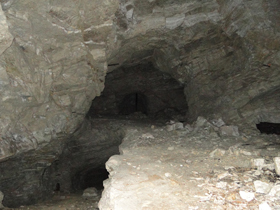 The presence of certain reduced chemicals can be due to the activity of anaerobic chemoorganotrophic Bacteria and Archaea in the deep subsurface. 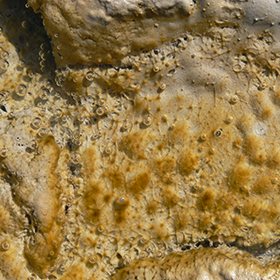 Aerobic chemolithotrophs at the spring mouth can make a living by oxidizing the emerging reduced solutes. 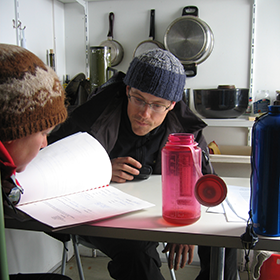 In the Jöri catchment we will follow the questions about how microorganisms respond and adapt physiologically to the complex interactions between ecological determinants, chemical, geological and atmospheric ones, and their variability in glacial lakes, in snow and on ice. 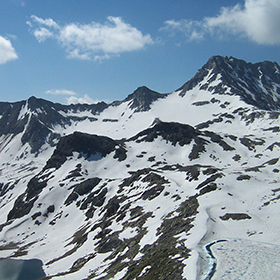 The studies are aimed at understanding the evolution of high-altitude ecosystems and of the microbial diversity in cold-extreme environments. 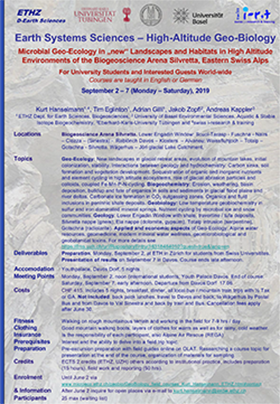 The topics are illustrated with results from research on "Microbial life strategies under harsh environmental conditions" and "Geochemical nutrient scavenging in nutrient-poor high mountain environments". 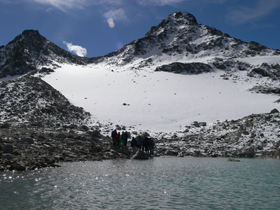 High altitude lakes, snow and glacial ice are ideal for the study of adaptations of organisms to a variety of environmental extremes: water temperatures are often near freezing, darkness under snow and ice lasts for many months every winter, UV radiation is strong during the summer months and nutrients are scarce. 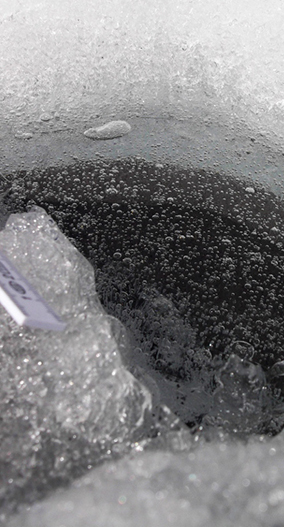 Yet, microbes living in cold-extreme environments have developed strategies to cope with constantly changing chemical and atmospheric ecosystem determinants. 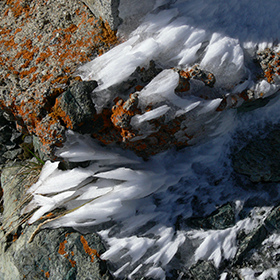 One wonders, how life has adapted to these challenges over time and is constantly amazed at the strategies microbes have developed to cope with extreme conditions. 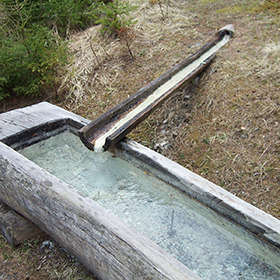 The Jöri catchment also offers sites to study the role of glacial erosion particles and of the geochemical iron cycle in nutrient scavenging, soil formation in remote areas and the quantitative contribution of air-borne natural components and pollutants to fertilization and to the chemical composition of the water. 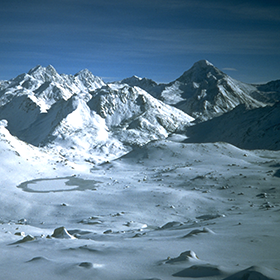 Jöri Glacier below Flüela Wisshorn from Lake III, December 1999. At Totalp and Champatsch, former magmatic intrusion areas which are dominated today by serpentine and ophiolite rocks, we illustrate and discuss how the chemical energy stored in magma might have been released during the interaction of magmatic peridotite with water. 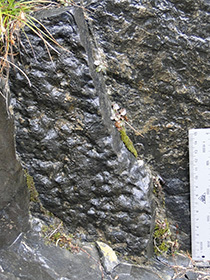 The presence of hard magnetite crystals on weathered serpentinite implies that serpentinisation must have occurred, and pillow lava structures tell us that the transformation must have taken place in water, most likely at an expanding ridge in the depth of the Tethys ocean. We reconstruct thermodynamically how the release of chemically bound energy in rock minerals can "fuel" life, i.e. how the lithosphere interacts with the biosphere. 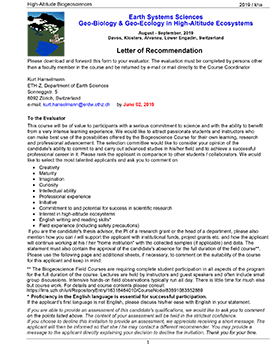 Serpentine can release a number of chemical compounds which might be needed by certain microbes and plants as essential elements for biochemical functions; some are toxic to mtabolism, however, and inhibt growth. 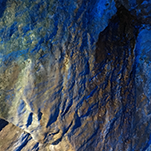 Oxidation of rock minerals in water can lead to the abiotic synthesis of organic molecules which in turn can support the selection of living organisms and early ecosystem development. 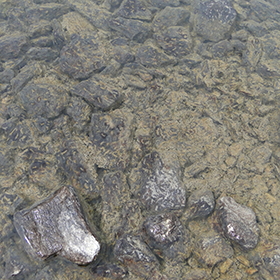 In the iron-rich Gneiss rocks of the Silvretta nappe, which covers the entire Jöri catchment, we study how iron compounds released during rock weathering and nanoparticles produced by mechanical glacial erosion or by wind-blown ice crystals sequester nutrient-type molecules, a prerequisite for life in newly created aquatic and terrestrial environments. Bio-weathering of silicate rocks by lichens as CO2 sequestration mechanism and efficient assimilation of nutrient-type erosion minerals from flowing water by veil-forming Hydrurus sp. 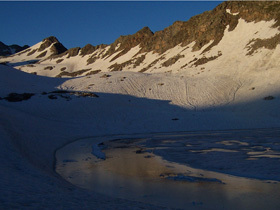 Natural lakes in touristic areas are transformed more and more into water reservoirs for technical snow forming machines, processes that alter hydrologcal cycles and soil compaction. How will the Jöri watershed look like 20 years from today? If the temperature increases as predicted, the 0°C-line climbs higher and higher, the snow seasons become shorter and more precipitation falls in the form of rain instead of snow. If changes of the environmental conditions continue at the rate they have in the last decades, what will be left of a former glacier and how much of the permafrost ice will disappear within the next couple of years? New habitats will be created, while some of the aquatic ones will dry out for part of the year. 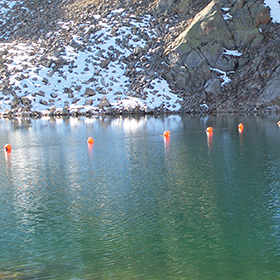 Most larger and deeper lakes might stay but their water exchange regime will slow down. 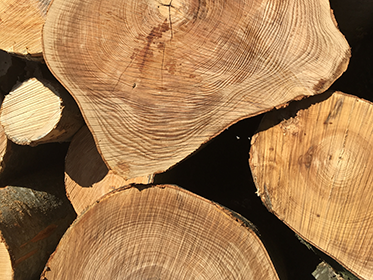 In future years, they will be fed exclusively by rain and snowmelt water, but the ice melt water will no longer be available during the summer months. As a consequence, the loads of fine erosion particles will decrease and the geochemical cycling of nutrient-type elements will change too. 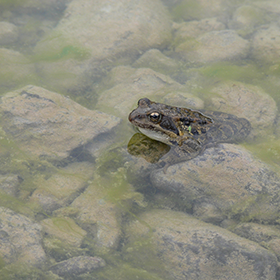 This will lead to new challenges for the aquatic organisms that are presently colonizing the lake habitats. 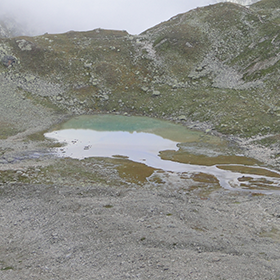 Since the retreat of the glacier during the last decades has happened in a geomorphologically rather steep altitudinal watershed, one can follow life histories in lakes of different ages already. 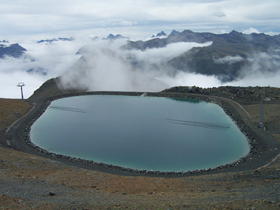 Today, we distinguish 4 stages in the development of mountain lakes; all 4 are present in the larger Jöri catchment area. lakes that are silting up and are in a state of becoming swamps and bogs (lakes II and XIV). Lake XIV - a sedimentation basin for mineral abrasion particles Lake XIV is not only a sedimentation basin for glacial abrasion minerals, it also directs water and the finest mineral particles into an underground hydrological system whose connectivity across the moraines feeds lake III and springs. 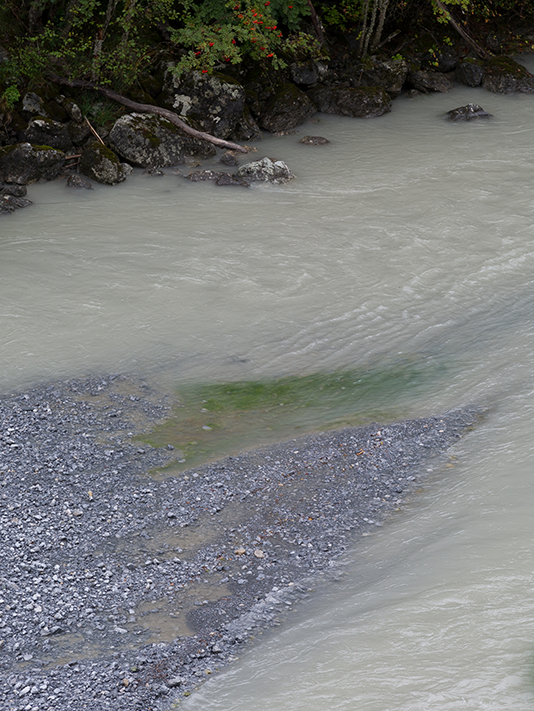 Two moraine springs which emerge a few meters above the surface brook between lakes III and II support dense populations of Hydrurus holdfasts and cyanobacterial biofilms. The figure explains the connectivity of the lakes in the 5 Jöri sub-catchment. 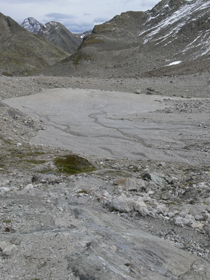 A number of the shallow, temporary ponds in rocky areas which are fed today by glacial melt water will probably change into seasonally ephemeral ponds once the glacier ice has vanished. They might change into so called vernal ponds which are more frequently found in grassland areas. 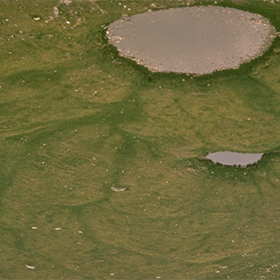 Vernal pools are flooded by snowmelt and rain water which is retained if the soil underneath contains layers that act as penetration barriers. 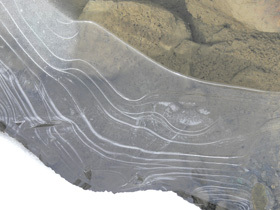 Over the summer the water evaporates leaving muddy holes or cracked dry mud flats. 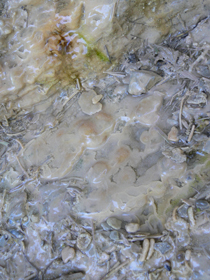 Distinctive vernal pool biofilms, plants and animals are selected for withstanding the annual cycles between intermittent flooding and drying. 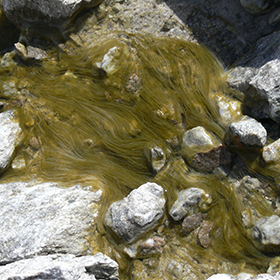 Anaerobically produced sulfide emerges from a number of springs near Alvaneu Bad. 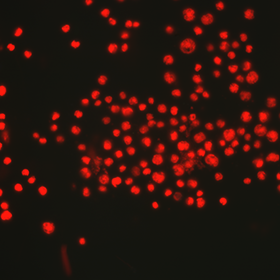 It is oxidized by aerobic Thiothrix sp. 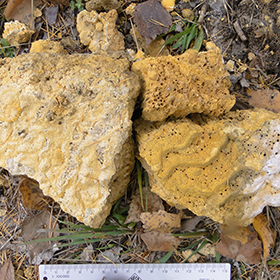 bacteria, which convert the sulfide-sulfur into elemental sulfur and store it intracellularly. 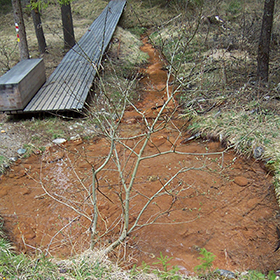 "Rust" in the outflow of the Arvadi ferrous iron spring consists of badly soluble ferric-oxides and ferric-hydroxides, which give the habitats of the sulfide oxidizing bacteria a dark red color. 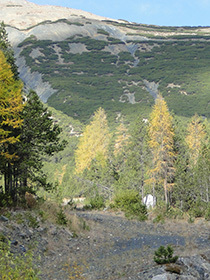 The Lower Engadin is the narrow valley between Zernez in the west and the Swiss boarder to Austria in the east, including all side valleys that drain into the Inn river. 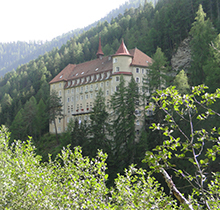 Over a distance of about 50 km, the descending slope of the Inn is about 600m. 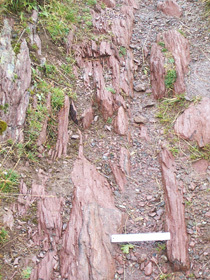 The LEW is a tectonic opening into penninic sediments whose layers appear as Bünden shale outcrops overlain by gneiss, serpentinite and dolomitic rocks. 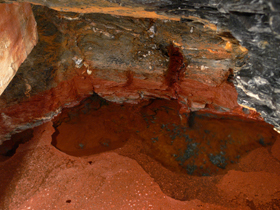 The waters that emerge from the LEW aquifers are a partial mirror image of the underground geology and the time the water stayed in contact with the rocks. 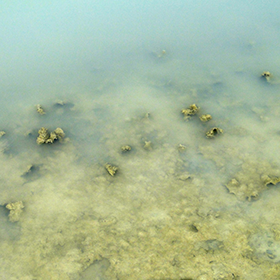 Some waters are oversaturated with regard to calcium carbonate, and they contain elevated concentrations of "old" dissolved CO2, some of which might stem from the degradation of organic remains of biomass that was formed several hundred million years ago, as well as variable amounts of dissolved anions and cations that were adsorbed to clay erosion particles during sedimentation in the Tethys ocean. 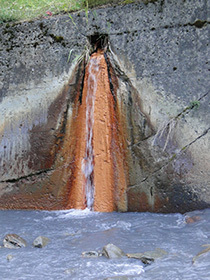 The springs in the Lower Engadin are the interesting manifestation of the unique geological anomaly known as the Lower Engadine Window (LEW) and have recently been shown to be a source of valuable information regarding the action of microbes in influencing geological deposits. 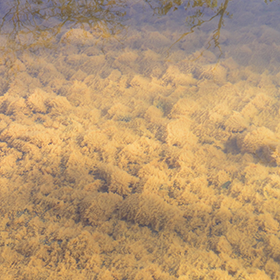 Some spring waters that emerge from the LEW contain sulfide, others arsenate in addition to dissolved ferrous iron. 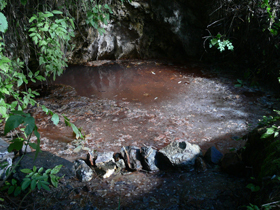 Aerobic chemolithotrophic Bacteria at the mouth of the springs can make a living by oxidizing the reduced compounds or by using arsenate as oxidant. 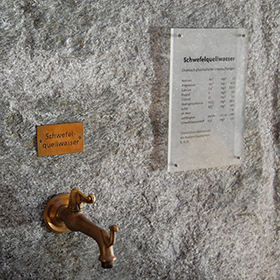 Various oxygenic and anoxigenic phototrophic microorganisms thrive at the spring outlets. They make use of the dissolved mineral ions and are involved in temporarily preventing precipitation of "new" carbonate minerals. 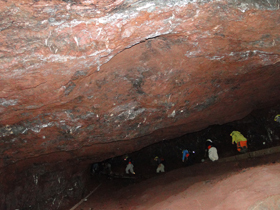 Dangerously large amounts of gaseous CO2 are formed in some enclosed areas underground. When the carbonic acid / bicarbonate saturated aqueous solution reaches the surface the dissolved H2CO3 equilibrates with the CO2 of the atmosphere. 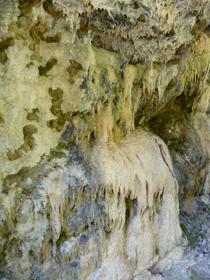 While the CO2 outgasses, floating cold-water carbonate ice and foams are formed and travertine and tufa terraces precipitate at the spring outlets. 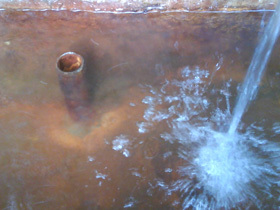 A number of bacteria are able to make use of the energy which is released during the oxidation of ferrous iron to ferric iron. Since only one electron gets transferred to an oxidant during Fe(II) oxidation to Fe(III) and since only small amounts of energy get released, a lot of Fe(II) needs to be oxidized to support growth. 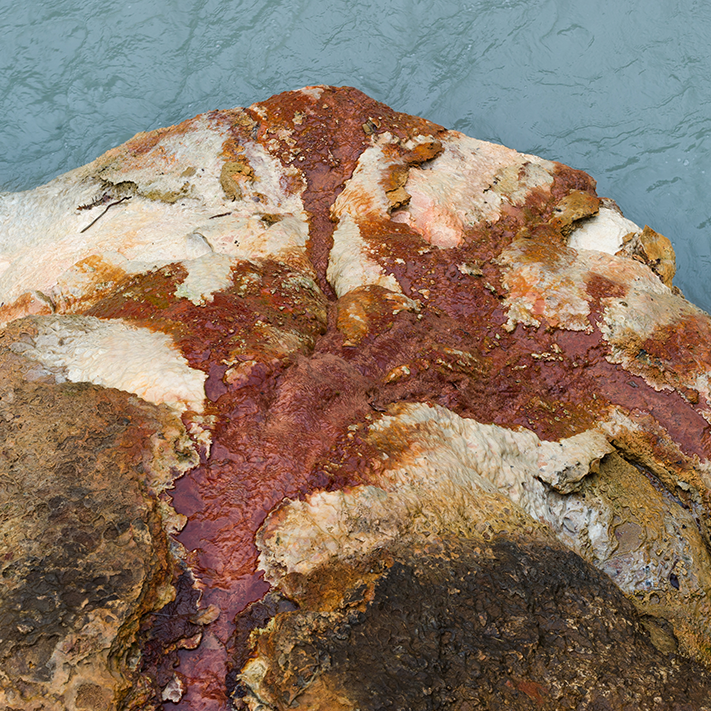 Large volumes of biological "rust" can thus be seen everywhere in iron-dominated ecosystems, particularly in redox transition zones at the surface of ponds and in biofilms on rock walls. 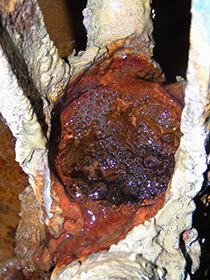 The "rust" consists of badly soluble iron(III)-oxides and iron(III)-hydroxides. Bacteria (e.g. 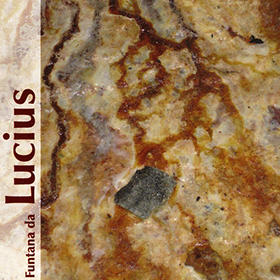 Gallionella ferruginea and / or Leptothrix spp.) catalyze the ferrous iron oxidation. 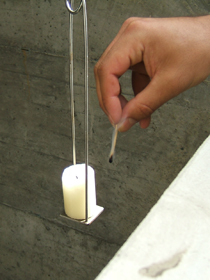 They produce an extracellular sheath on which the amorphous ferric material precipitates. At one of the excursion sites, we will see mass developments of sheath-forming ferrous iron oxidizing bacteria and many empty sheaths. We will try to understand the habitat conditions which must prevail to select specifically for the kind of bacteria found here in large numbers and how they might be maintained. 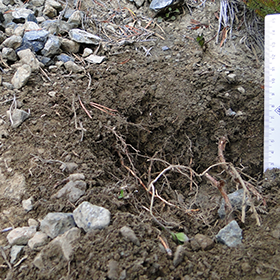 We will observe scarce growth of vegetation on tailing slopes of former Pb and Zn mines, will search for causes and compare the soil development on tailing heaps with the one on serpentinite in an altitudinal gradient. 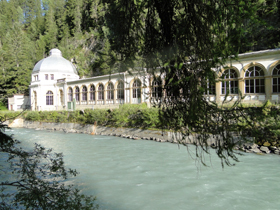 From Victorian times until the thirties of the last century, a major portion of the economy of the Lower Engadin was based on its wealth of mineral springs. Their number and variety led to an enormously popular and prosperous health spa tourism in the area. 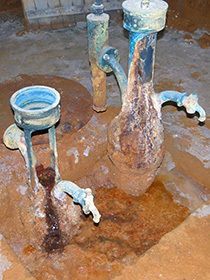 Many of the mineral waters are rich in reduced ferrous iron, an essential element needed by our body in concentration ranges of a few to several hundred nano grams per milliliter of blood. Fe is essential in Hemoglobin, an iron containing component of erythrocytes and Ferritin, an iron binding protein. Iron-rich mineral water added to a balanced diet can serve as an easily accessible iron source for anaemic patients as well as women with heavy menstrual patterns. 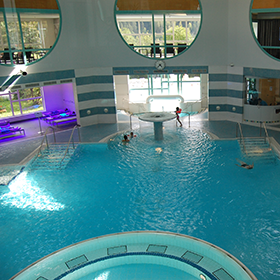 Today's "Spa & Action Tourism" is still based on the hydrogeological phenomena in the LEW. 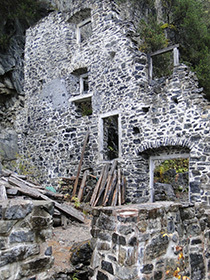 During the field trips we will see remnants of the 19th century wellness comfort for the wealthy and can study how modern tourism marketing makes use of a local geological uniqueness. Steep morphological gradients, exposure to harsh seasonal changes, lots of precipitation in the form of rain and snow bear enormous potential energies and unpredictable dynamics. When released suddenly they can lead to mass movements with large destructive power. 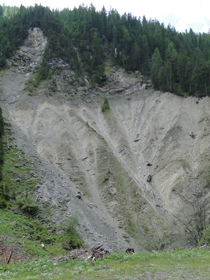 Although these are natural processes in mountainous environments, one considers them as "natural" disasters and catastrophies, if man-made structures are destroyed or lives are lost. Communities are making great efforts to identify dangers, to predict the probability and frequency of occurrences, to calculate the costs of possible damages in endangered areas and to take protective actions. We will discuss scenaria that illustrate risks and adaptations to them and study engineering efforts aimed at minimizing possible losses by identifying danger areas and by building and maintaining protective structures. 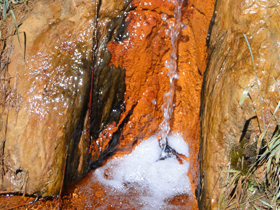 Iron oxide minerals at spring outflow. 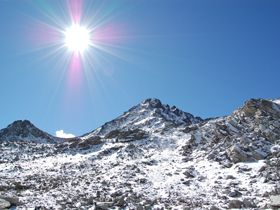 When we search for signs of life in High Mountain habitats in the darkness of winter below ice and snow, and in the cold of Cryoconite Holes on glaciers, we have conditions in mind that show some similarity to past or possibly even present conditions in habitats on Mars, the icy moons in the solar system, on early Earth or during Snowball Earth periods. Liquid water, a prerequisite for life, might be present in subsurface aquifers on Mars and in the oceans below the surface of the icy moons like Europa and Enceladus. 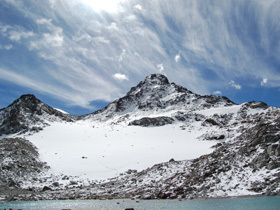 High Mountain winter times are thus model systems for such extraterrestrial extreme conditions. Besides water, criteria for habitability of ecosystems are also the presence of energy sources, oxidants and life-supporting nutrients. 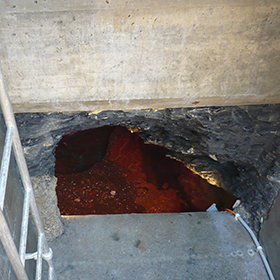 They are shut down during the winter months but organisms still survive without light and liquid water. 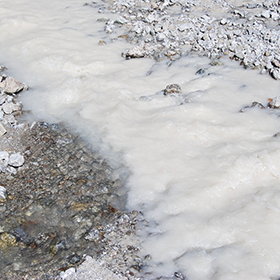 Near Alvaschein and on Alp Weissenstein, for example, we find crystallised white gypsum, an evaporitic rock mineral, which was formed by precipitation from an oversaturated brine in ancient coastal environments. The observed presence of this mineral in subsurfaces on Mars implies that Ca2+ and SO42- ions must have been present in saturating concentrations in former martian aquifers. But it also implies that sulfate-reduction could have happened in the absence of molecular oxygen. 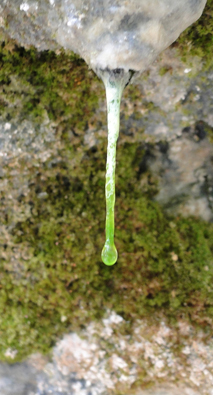 Release of H2 by exergonic reactions of H2O on peridotite rocks (serpentinisation) is a key prerequisite for habitability in darkness of the subsurface anywhere in the universe as well as here on Earth. 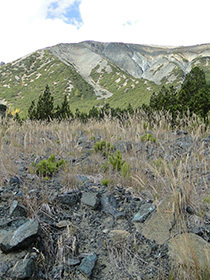 Zones where this might have happened during the late Cretaceous and Jurassic eon are the serpentine areas of Totalp where we find weathered rocks today which contain mineral products of past serpentinisation events Magnetite) and pillow lava structures on Alp Champatsch, indicating extrusion of magma into an ocean. 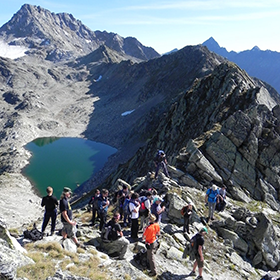 By combing lectures and field observations, the course aims to discover signs of life in a number of geological settings in High Mountain habitats in the Alps. 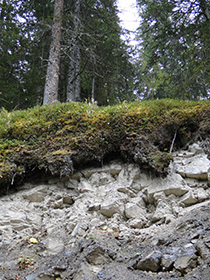 Records of landscape and ecosystem evolution: Erosion - Sedimentation - Soil Formation - Vegetation. If you would like to participate in one of the Biogeoscience Courses, please download the two forms, fill in the required information and submit your request. 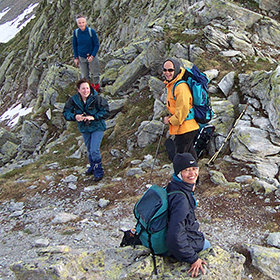 The reference letter is required, if your study or work institution is not a member of the Silvretta consortium. If you intend to get study credit you need to have your supervisor confirm that your institution will recognize the course as part of the requirement for your degree program. 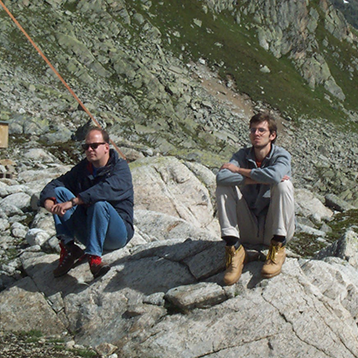 Through dedicated Master and PhD students and their advisors who did part of their research work in the Silvretta Arena over the past decades, the many scientists from all over the world who attended conferences in Davos and participated in science field trips to the Jöri lakes, the technical staff that maintained the local facility, representatives from numerous Swiss research and educational institutions and the frequent site visits by the public and by school classes we assembled a wealth of insights into a better understanding of High-Altitude Geobiosciences and a network of national and international partners. 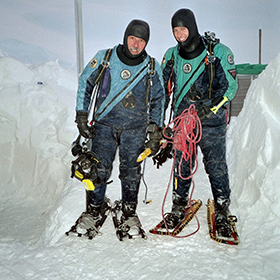 Working under harsh conditions at high altitudes requires appropriate infrastructure, people who maintain it and researchers with a good physical condition. 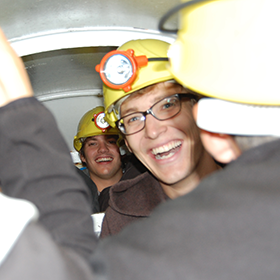 Collaborations between Geomicrobiologists, Chemists, Geologist, Geochemists and Biogeoscientists make field trips most successful for students and instructors. New ideas might emerge during times of reflection and alternative approaches become obvious when exchanging ideas with others. All this will impact achievement and satisfy careers. 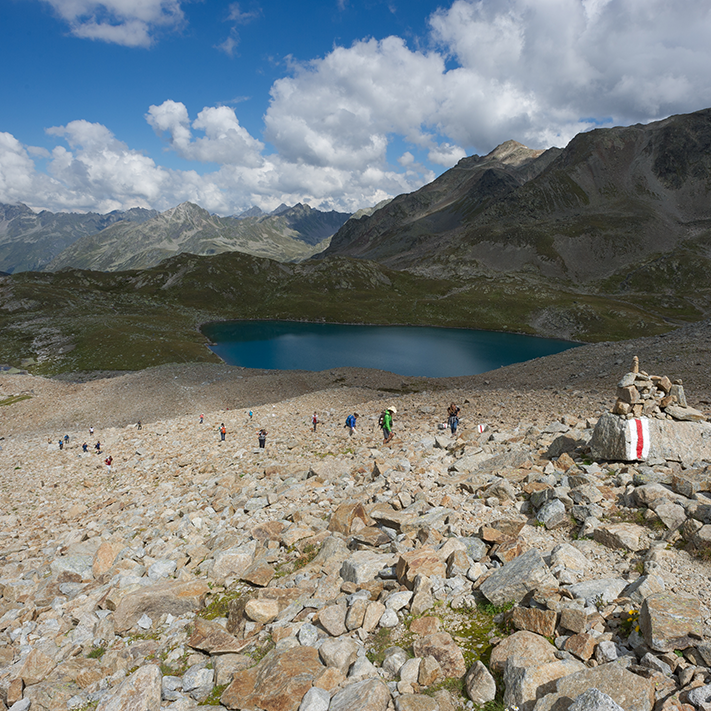 The Silvretta Science Arena is a classroom in nature. 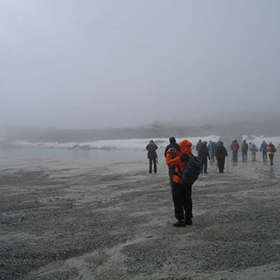 Seeing, experiencing, smelling and observing under actual conditions are didactic approaches that help learners of all levels to get excited about natural sciences and to understand what global changes actually mean. Key words: Long-term observations, documenting changes, scientifically interested public, science observatory, model verification. 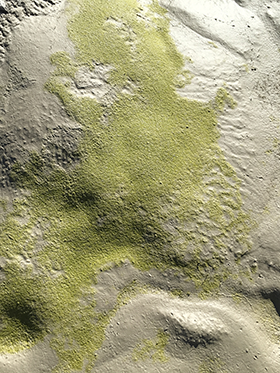 Based on observations of past changes recorded in geochronological archives (rocks, ice, sediments soils, trees) and basic principles of physics, chemisty and biology, modellers aim to predict how the future of an environment could look like. By observing nature based on the same basic principles and recording changes we get a realistic view of what is actually happening. 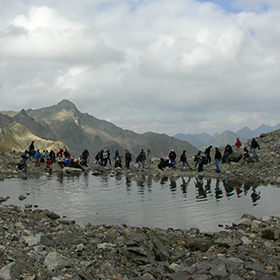 Due to different lithologies, relief exposures and hydrologic regimes the Silvretta Arena offers a large number of divers sub-ecosystems in a relatively small area. 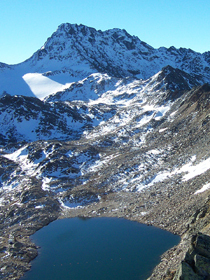 They are representative for high-altitude ecosystems which are changing every year as a consequence of natural environmental variability and global change trends. Long-term observations are essential to document these changes and they must be based on comparable baseline situations. We count on the scientifically interested public to participate in critically observing and precisely documenting ongoing changes and reporting their observations to the science observatory at swiss | i-r&t which makes the data available for research and to decision makers. During Citizen Science Study Weeks and Teacher Training Courses, we design suitable projects, collect observations and data, search for explanations by consulting experts and the literature and assemble the material into either learning units for schools or scientific slide shows and movies which are presented on this website for further use by others. 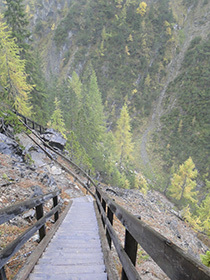 Although much of the land is privately owned, it is open and accessible to the public on foot. 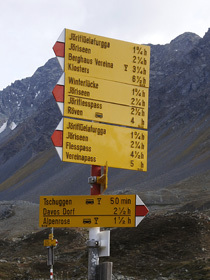 Many regions can easily be reached from nearby towns by public buses and trains that serve entrance locations into the Silvretta Arena and valley stations from where cable cars transport people to higher altitudes. 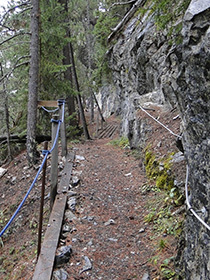 Walking paths are well developed and maintained and more risky passages are marked. 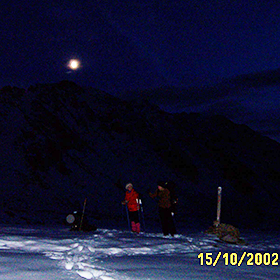 There are several mountain cabins in the region which allows for longer visits and detailed studies and as shelters and rescue bases. 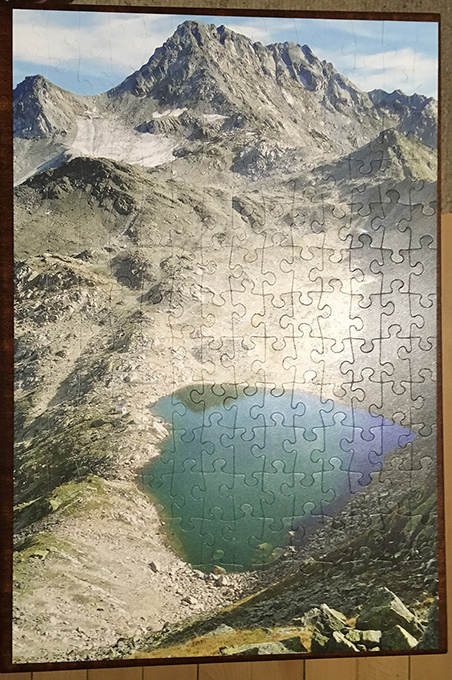 Puzzles from the Biogeoscience Arena Silvretta, 30x45 cm,196 pieces, approximately 2+ hours concentrated and instructive entertainment for bad weather or relaxing days. 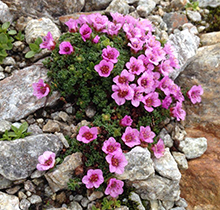 The interdisciplinary online learning platform ALPECOLe - Alpine Ecology and Environments a product of the Swiss Virtual Campus project to which a number of mountain research specialists contributed, introduces additional topics about high-altitude environments. The platform is didactically well structured and self-guiding. Currently, its 4 modules contain 26 topic lesson which supplement the i-ESS course contents excellently. and a Glossary which defines terms most commonly used in GeoBiology and GeoEcology. ALPECOLe is recommended for the preparation of participants who got accepted to i-ESS courses. 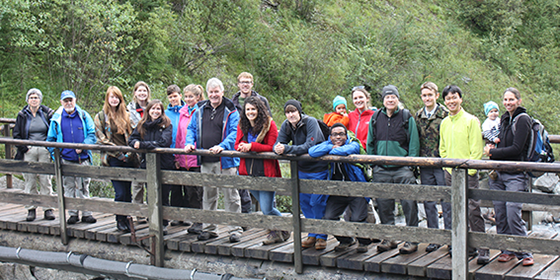 By the end of the Biogescience Field Course you will be able to assign the pictures to the locations which we visited, tell why we went there and what we studied. This site is an Open Educational Resource (OER). 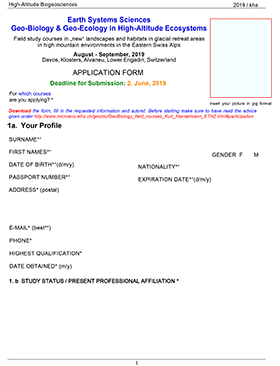 Most photos, videos and graphics presented in this study site stem from students and instructors of past i-ESS courses or from research collaborators. The material is copyright protected under a Creative Commons (CC) license. All material is freely available for non-commercial uses by teachers and learners. It may be adapted and shared. Please read and follow the code of honor, if you would like to use any of the course contents. Materials made available in the LMS OLAT are for the exclusive use by course participants.